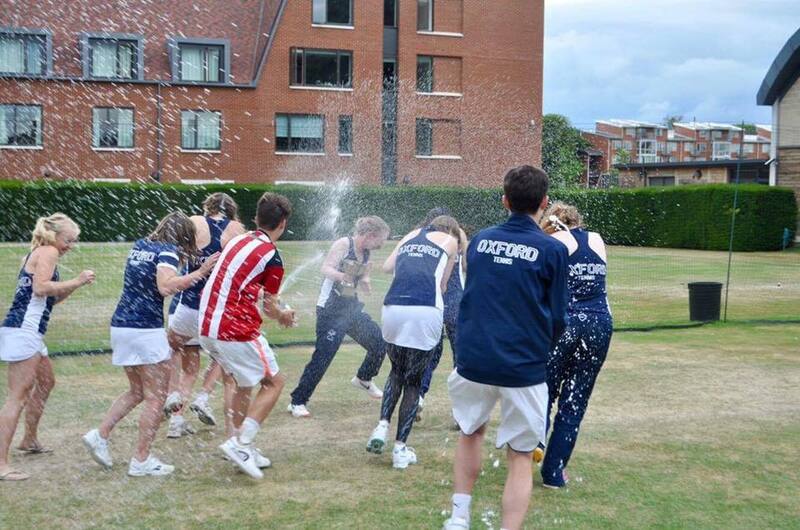 Welcome to the first edition of the Oxford Sport Newsletter, your one-stop shop for fixtures, results, reunions and more from the University of Oxford’s sports clubs. This term’s issue contains a greeting from Laura Fenwick, the new Sports Federation President, news about the Topping Out of the Gallie-Lewis-Dean Gym and our Celebration of Oxford’s Rio Olympians, as well as updates from American Football, Baseball and Softball, Basketball, Contemporary Dance, Cricket (Men’s), Hockey, Korfball, Lacrosse, Lifesaving, Netball, Pistol, Polo, Rifle, Rowing, Rugby Fives, Rugby League, Rugby Union, Ski and Snowboard, Swimming, Tennis, Underwater Hockey (Octopush), Volleyball and Windsurfing. We hope you enjoy reading it! Please get in touch if you have any suggestions or submissions for our next edition. Hello, I am Laura, the new Sports Federation President for 2017-18. I graduated this year with an undergraduate Masters in chemistry, and during my time as a student I was an active member of several Sports Federation clubs. I am a strong believer in the positive influence sport can have on all aspects of life, in particular wellbeing, and among the large variety of administrative and representational roles I will tackle this year I’m keen to raise the profile of sport in Oxford both for elite athletes and at a recreational level. 2016-17 was a successful year of individual and team performances from our clubs in Varsity matches and BUCS, and in other league games and competitions across the country, continent and world. 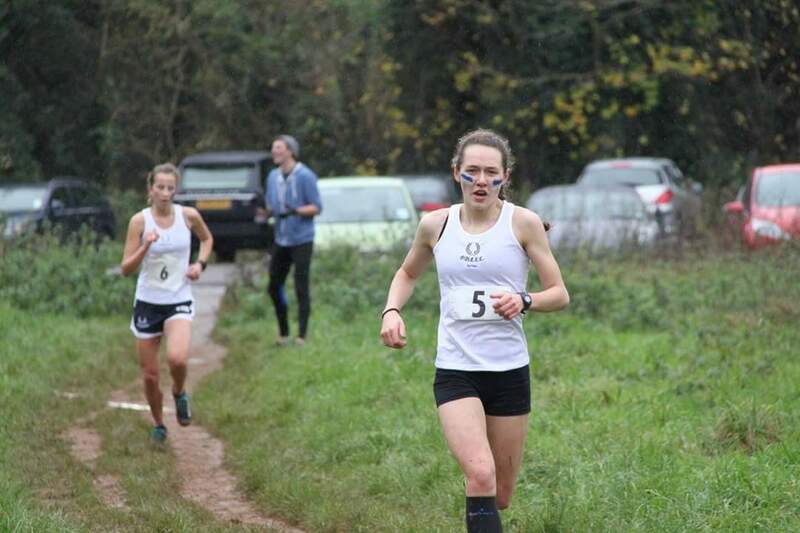 Notable BUCS performances included women’s Boxing and Modern Pentathlon, both of whom were crowned team champions. Women’s Judo and women’s Ultimate Frisbee, meanwhile, were runners up, and Boxing, Judo, Cycling and Fencing all produced individual champions. 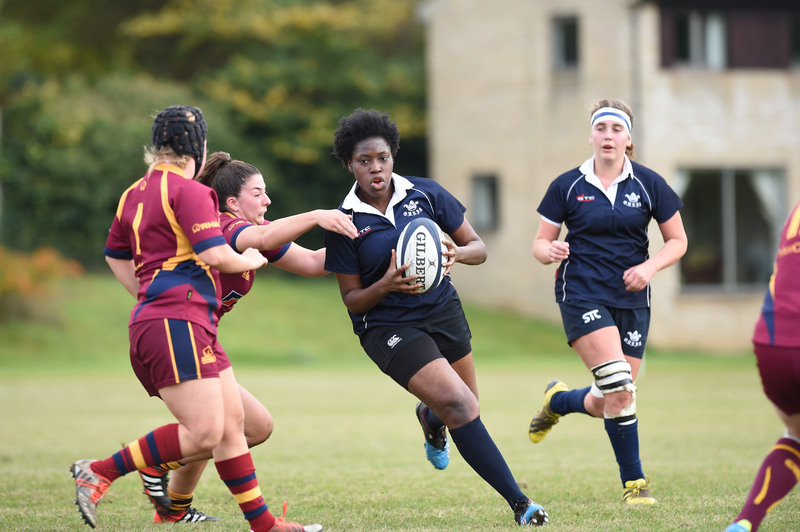 Positive steps also continued to be taken towards gender equality in Oxford Sport following the merger of the men’s and women’s rugby union clubs in 2015-16, with the Varsity football match being played as a double header for the first time last year. The Sports Federation welcomes two new clubs this year, bringing the total number of affiliated clubs to eighty three. The new clubs are the Oxford University Baseball and Softball Club and the Oxford University Kabaddi Club. Despite these successes and improvements, Oxford has fallen to 13th in the overall BUCS rankings, three places lower than last year. Though we have maintained our overall points total and remain ahead of Cambridge, as other universities have improved and progressed at a faster rate with increased facilities, funding and staff support we have slipped to our lowest overall finish since the start of the competition. It is hoped that the facilities redevelopment at Iffley Road and the new Blues Performance Scheme, as well as the continued hard work and dedication of our athletes, coaches and staff, will help us to keep pace with other institutions and push us back up the table in 2017-18 and the years to come. Finally, the 15th Annual Sports Awards, a celebration of the 2016-17 season, will be held at Oxford University Rugby Club on Friday 17 November. All club members, past and present, are invited to attend. Alumni interested in attending should contact their club’s current committee or the Sports Federation for more details on how to purchase tickets. The topping out of the brand new Gallie-Lewis-Dean (GLD) Studio took place on 27 June, with the multi-purpose activity room set to open to students, staff and members of the local community at the end of October. 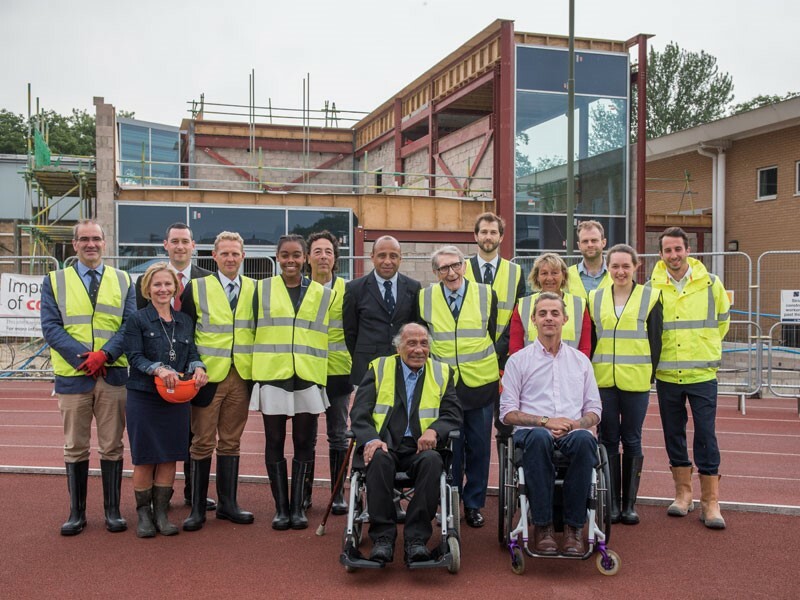 Part of the first phase of the University’s long-awaited redevelopment of Iffley Road, it will be used by the Oxford University Amateur Boxing Club (OUABC) in addition to providing a range of fitness classes for members of the public. It has been named in honour of former OUABC head coaches, Alf Gallie, Percy Lewis and Henry Dean. Alf Gallie BEM devoted his life to boxing and rugby in Oxford, and trained and coached hundreds of local athletes, as well as treating many for injuries, in a career that spanned more than 40 years. He died in 1985. One of Alf’s protégés, Percy Lewis represented Great Britain at featherweight in the 1952 Helsinki Olympics alongside teammate Henry Cooper. In 1957, he won the British Empire featherweight title. Henry Dean, a former England international and sparring partner of Percy’s, was instrumental in the Dark Blues record of 16 consecutive victories over their Cambridge counterparts during the 1980s and 1990s. Percy and Henry, supported by family and friends, donned safety boots, high-visibility jackets and hardhats, before being given a tour of the new facilities by Jonathan Brock from Beard Construction, and David Jobbins of Bidwells. Former Oxford student, Chris Mack, who trained under Alf, Percy and Henry, has been leading the charge in fundraising for this part of the project. “The response from alumni to the appeal has been fantastic, with donations coming from those who fought as far back as 1946. There is a huge sense of camaraderie within OUABC, and amazing gratitude and affection for all coaches past and present”, he said. The GLD Studio will open at the end of October alongside a new reception area, café and changing rooms. The remainder of the £9.3 million state-of-the-art Acer Nethercott Sports Centre will follow in March 2018. Over the summer, the Vice-Chancellor, Professor Louise Richardson hosted a special event in the Blackwell Hall to honour the 15 Oxonians who took part in the Rio 2016 Olympics, producing one of the University’s best ever medal hauls: 5 Golds, 3 Silvers and 1 Bronze. If Oxford were a country, it would have placed 18th in the medal table, beating New Zealand, Canada, Greece and Argentina. The evening consisted of a drinks reception and a panel discussion chaired by Dr David Hemery, an alumnus of St Catherine’s College and a past World Record Holder and Olympic and Commonwealth champion in the 400 metre hurdles. Dr Hemery was joined by Pete Reed, three-time Olympic gold medallist rower; Dan Fox, Olympic hockey player in London and Rio; and Sophia Saller, who was world under-23 triathlon champion in 2014 and is currently pursuing a Mathematics DPhil. Completing the panel was Grace Clough, Paralympic rowing gold medallist in Rio, and a Master’s student in Sociology at Kellogg College. 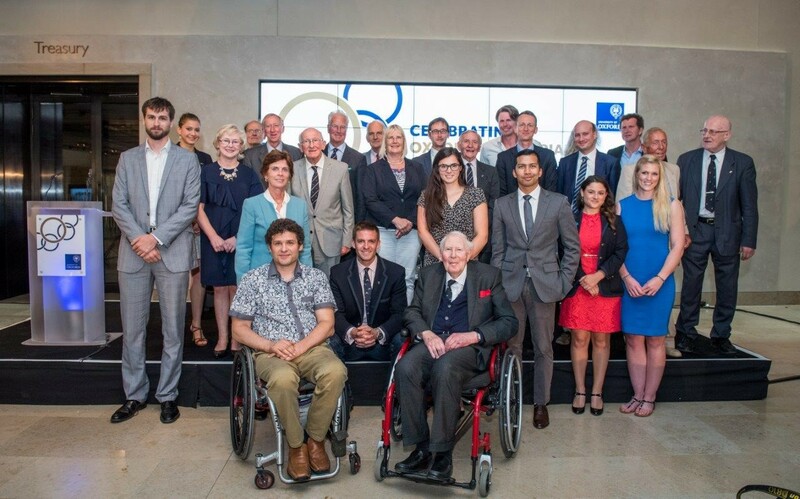 Among the attendees were several other former Olympians, including Barbara Slater, Allan Jay, Zoe de Toledo, Paul Bennett, Olivier Siegelaar, Dr Zoe Lee, Sir Roger Bannister, Michael Ralph, Pauline Janson, Annabel Eyres, Dr Nick Howarth, Justin Frishberg, Colin Smith, Dr Paul Mattick, Jonny Searle, Richard Fishlock, John Chester, Graham Cooper and Alexander Lindsay. The evening was made possible thanks to the generosity of Dr Aron Ping D’Souza. American Football is one of the fastest growing sports in the UK. This is no different at Oxford University – the past five years have seen an explosion not only in student interest, but in the success of the club as a whole. Coming off the back of our most successful season in history (2015-16), the Oxford University Lancers American Football Club (the Lancers) achieved a fair number of accolades this past year. We were nominated for three different Sports Federation awards – Club of the Year, Coach of the Year, and the Norman Bryce Smiley Trophy for the sportsperson who best reflects Norman Smiley’s values. While honoured to be nominated for all three, we were especially pleased that our head coach, Andy McKenzie, took home Coach of the Year against a tough field of traditional UK sports. We also achieved a long-term goal when we were awarded Half-Blue status. This past May, after a thrilling battle with Cambridge, we had the privilege of nominating the first Blues class for American Football at Oxford. We recently had the opportunity to take our talents outside of the UK on our first annual tour match. 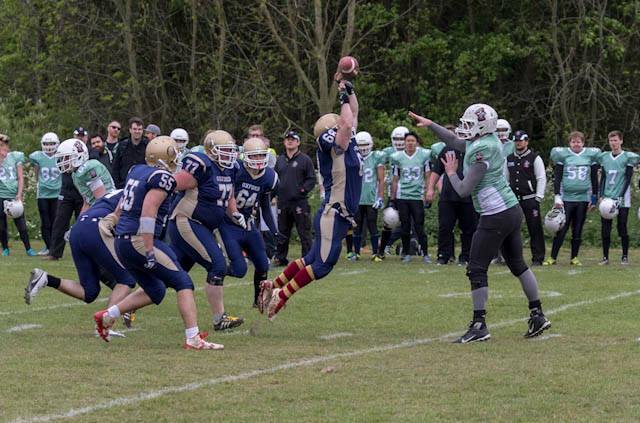 The Lancers travelled to Ireland to take on the UCD American Football Club. Unfortunately, after a thrilling match we fell just short at 32-30, but a great experience was had by all and there was ample opportunity to experience Dublin and connect with other students and coaches who share a love for the game. This season we are planning to travel to Belgium to continue the tradition of spreading Lancers football as wide as possible. Any additional funding we can secure will make a big difference to the club. Our recruitment drive for the 2017-18 season is currently underway and we already have several promising freshers who will join a strong veteran group. We have high hopes for a successful year that will send us back to a Championship game and bring the coveted Varsity Bowl back to Oxford where it belongs. We encourage anyone in Oxford to join us on Sunday 3 December at Wheatley Campus Field for our biggest game this term, the Cavaliers Cup. We will take on Brookes University in what is always a fast-paced, hard-hitting contest. If you would like to stay up to date with all the current news, scores, highlights, and action, you can check out our website or follow us on Facebook. Many thanks for taking the time to read about the the Lancers, we hope that you will follow us and lend your support in the future! After two years, baseball at Oxford has made a comeback – now with softball included! 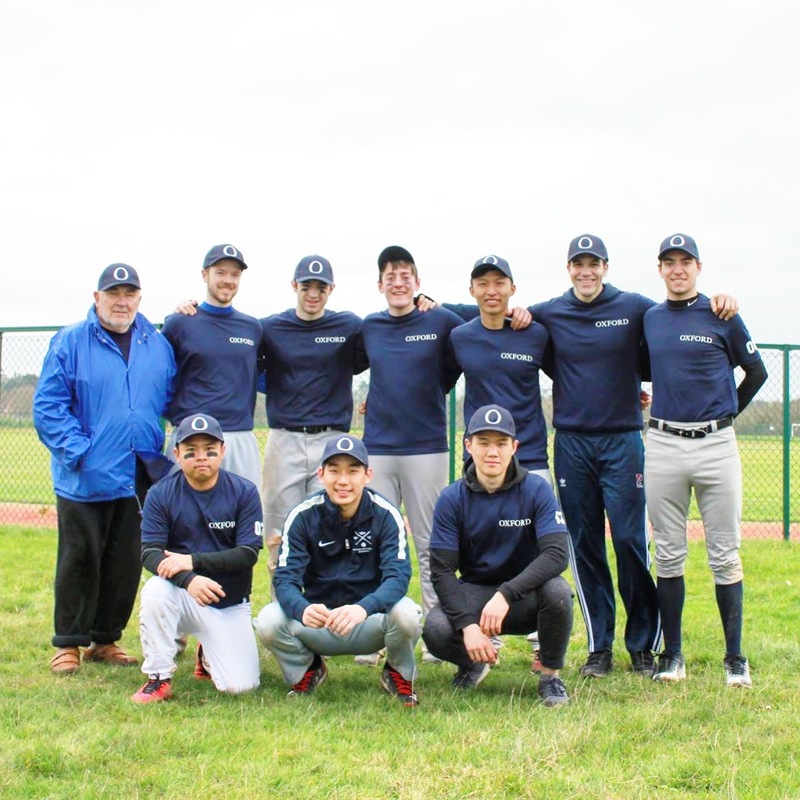 The Oxford University Baseball and Softball Club (OUBSC) debuted as an official university club at the National University Baseball Championships on the weekend of 0 week. We were placed in the death group (as described by UCL’s audit), with teams such as Loughborough and Queen Mary’s (the eventual champions and runner-ups). Nonetheless, we came back with a 14–5 win against Queen Mary’s and ended the championship in 11th place. This was a rise in five ranks from the spring tournament in which we tested the club’s viability before gaining our official university affiliation. Taking our success forward, we made our debut in the National University Baseball League against the defending champions UCL in week 3. On Friday of week 2, we hosted a club dinner to bond and strengthen our team spirit before battling it out. In other great news, the Cambridge baseball team has also been approved. This sets us up for an exciting Varsity match, fighting for the inaugural Varsity title. We aim to secure funding for training equipment through various schemes to ensure that we come back victorious! Finally, the softball department will also take a step forward, as we aim to enter both slow and fast pitch tournaments this year. 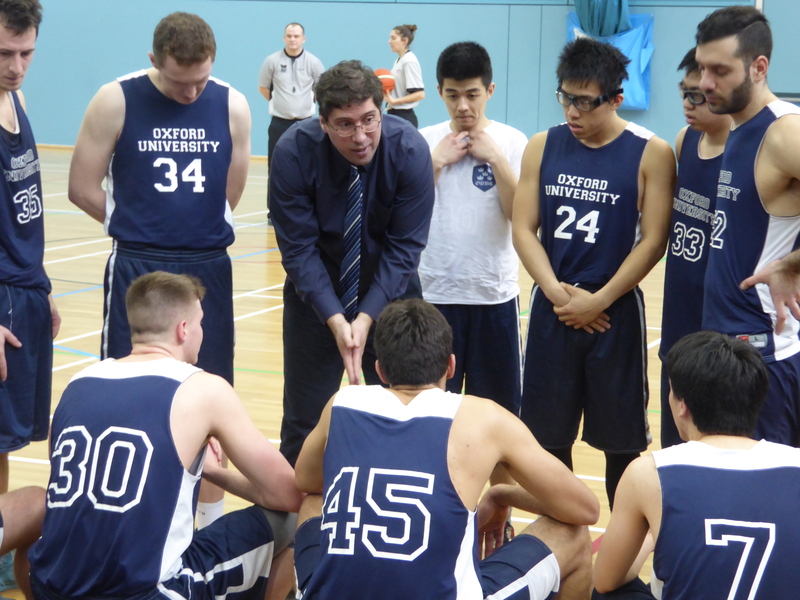 The 2016-17 season was very successful for the Oxford University Basketball Club (OUBbC). The men’s and women’s first teams (M1 and W1) both finished in third place in the BUCS Premier South league, securing them a trip to the final eights tournament, while the women’s second team (W2) was undefeated and achieved promotion. 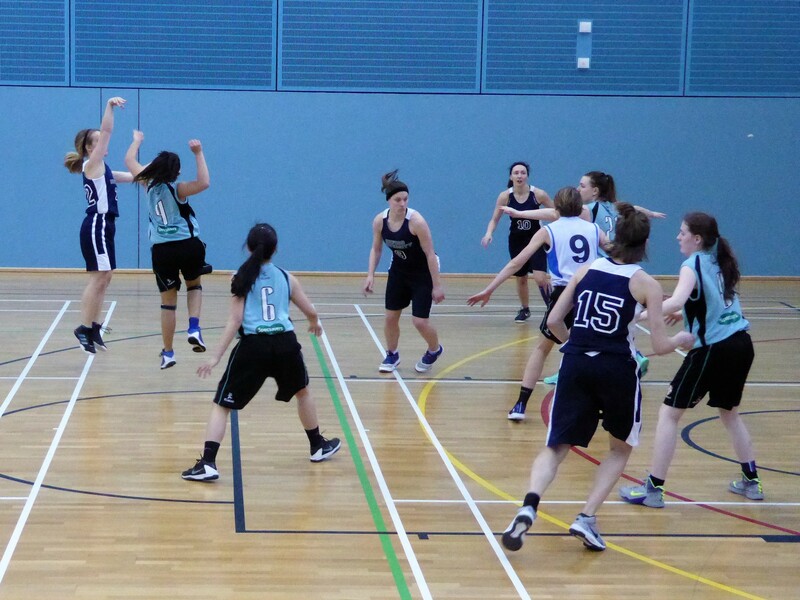 Varsity was more mixed, though it was a thrilling day of basketball with each game successively closer than the last. M2 and W2 lost by 6 and 2 points respectively; W1 triumphed in an overtime thriller; while M1 went down in a hard-fought double overtime loss. Under the leadership of outgoing president Tetyana Vasylyeva, we also developed a much stronger club identity. All four teams stayed to cheer each other on during the Varsity games in Cambridge and lent support to one another at other important games. A number of other activities filled out the OUBbC calendar last season. 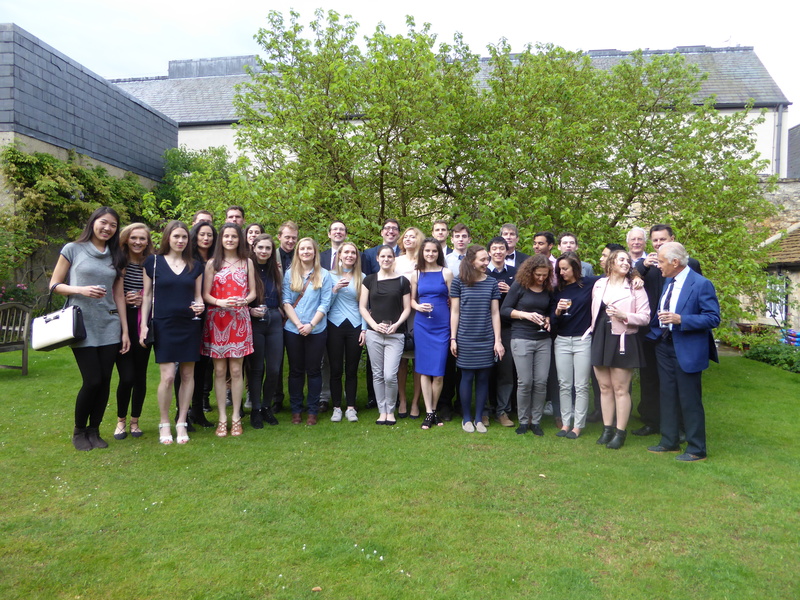 An increased range of events for alumni included drinks with the Corpus Christi President and dinner at the Turl Street Kitchen, alongside our annual alumni day in Trinity term. In addition, the club took its first foray stateside with an alumni drinks event in New York in support of the Development Office’s efforts to raise funds for a new basketball court. We also held a day of friendly games against the Urban Foxes, a London club for which several of our alumni play, and engaged more locally, working with Oxford Spires Academy to encourage young basketballers. With such a tough act to follow, the incoming committee have been working hard all summer to prepare for the 2017-18 season. Our first priority was the recruitment of a new coaching team for W1. A generous additional grant from a pilot support scheme for Performance Sports enabled us to bring some familiar faces back. Phil Kelly (former M1 coach) has taken up the reins of W1 with past player Julie Fricke as assistant coach. Taking inspiration from Julie’s return we are hoping to introduce a development programme for our coaches and some of our players by running a Basketball England coaching qualification course in early 2018. To pay for this, we will keep several places open for external candidates; if you are interested in attending, please get in touch! In addition to team coaches, we are incredibly fortunate to have the talents of Alex Bowmer at our disposal as head athletic trainer this year. Many seasoned players left Oxford at the end of last year, so the recruitment of new players and the building up of teams were also high on the agenda. Returning M1 coach Vassilios Copetinas organised our first ever preseason training camp, with both men’s teams spending the weekend of fresher’s week in Birmingham developing team skills and team spirit. The new recruits bravely stepped up to the challenge with only a few hours’ notice after try-outs, and it’s clear that they will make real contributions to both teams. We would love to expand the camp to the women’s side of the club in future years. For now, however, we are very much focused on the present, as all four teams began their BUCS campaigns with games on Wednesday of second week. Looking slightly further ahead, we are very excited about the new court in the Acer Nethercott Sports Centre being built at Iffley Road. This is expected to be finished in March 2018, in time for Varsity which is on home turf this year! We’d love to see alumni there on the day but if you can’t make it never fear – there’ll be another opportunity at our alumni day in Trinity term. In the meantime, we are always glad to hear from you, especially if your news is basketball-related. Please get in touch either by email or via Facebook. 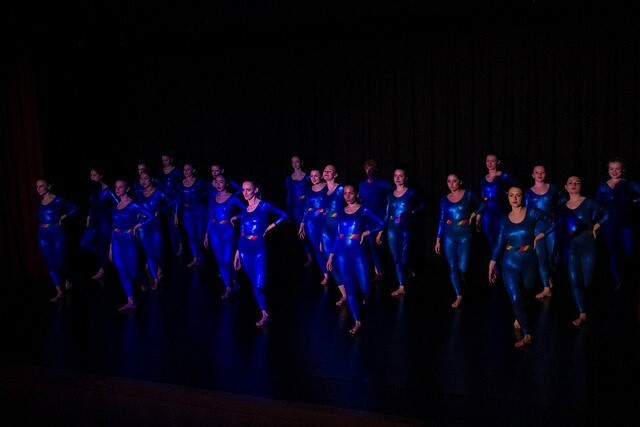 Oxford University Contemporary Dance (OUCD) is now in its second year of University affiliation, having last year transitioned from The Broad Street Dancers, the title under which we competed and performed for several years. 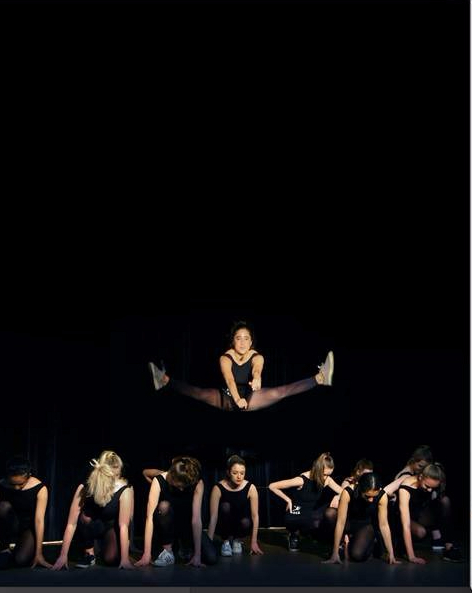 We pride ourselves on being one of Oxford’s most diverse competitive dance teams and this year will be competing in a whole range of styles – from ballet to hip hop, and tap to contemporary. We had a busy start to the year with three rounds of auditions and over 80 people trying out to join the team. We are now 31 strong and have already started preparations for KCL Just Dance It!, our first competition of the year, which will take place at the end of November. 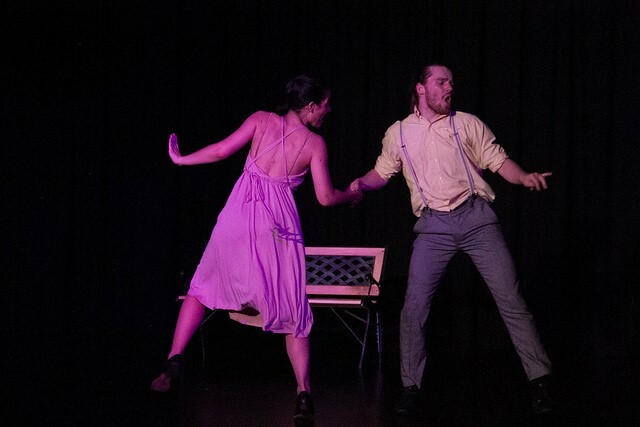 With two prizes from last year’s KCL competition under our belt and some very talented and enthusiastic new dancers, we have high hopes for this year’s competition season. The whole team will be competing in commercial and contemporary numbers, choreographed by Emma Clifford and Rachel Hunt, and we will also be putting forward specialist pieces of choreography for ballet, tap and hip hop. Our second competition this year will be at Southampton in February. This year we will be focusing on improving and maintaining technique as well as performance, and we have increased rehearsal hours to ensure there will be time for conditioning even in the hectic run up to competitions and shows. The biggest event of the year will, of course, be our annual showcase, which this year will be performed in the Pegasus Theatre in Cowley in late February. We are really excited about working on this huge project, which is entirely self-choreographed and always gets our creative juices flowing, and we can’t wait to see what our new members come up with. We always love to see alumni with an interest in dance in the audience so do come along if you are in the area on 16 or 17 February 2018. Hot on the heels of the showcase will be our Varsity match with Cambridge on the last weekend of February. This year the match will be hosted in Oxford and will round off the dance season nicely, with a break in Trinity for those taking exams. Follow us on Instagram and Facebook for news and updates! A strong Cambridge seam attack proved too good for Matty Hughes’ Oxford in this year’s four day varsity match on a wicket which offered plenty for the fast bowlers, as the light blues claimed victory after tea on the final day at Fenner’s. The Blues arrived in Cambridge in good spirits, having triumphed in a nail biting encounter at Lord’s ten days beforehand and come away with two positive draws in three-day warm up fixtures against the Free Foresters and MCC. After training in the indoor centre on the Monday afternoon, they enjoyed a relaxing evening familiarising themselves with Cambridge and arrived on the Tuesday morning ready for the final game in what had been a thrilling varsity series between two very evenly matched sides. Cambridge captain Patrick Tice won the toss and elected to bat: a brave decision on a pitch which looked green and patchy and had proved difficult to bat on for the whole season. Indeed, it was the Oxford seamers who drew first blood, as fresher Toby Pettman removed both openers lbw before lunch. In the afternoon and evening sessions, Tom Brock and 2016 captain, Johny Marsden, took over the wicket-taking role from Pettman, ending up with seven between them as Cambridge were bowled out for 225, with only captain Tice reaching a half century. That left an awkward session of around an hour’s play for Oxford to try to negotiate before the close, with the light fading and an experienced Cambridge seam attack running in with the new ball. Both opening bowlers extracted a huge amount of movement out of the patchy surface and Ruari Chrichard in particular caused havoc, taking four wickets in five overs, all caught behind. Without having really played a rash shot, Oxford found themselves five down at the close, with a massive mountain to climb on day two. Fortunately, the two men at the crease when play resumed on Wednesday morning were Alex Rackow and Jack Harrison, who showed impressive grit and concentration to negotiate a tough first half hour, before taking advantage of an older ball, sunnier overhead conditions and tiring Cambridge bowlers. Their partnership of 106 put Oxford very much back in contention. When Harrison was finally removed for 38, Rackow continued on with the acceleration, eventually falling tantalisingly close to a first class hundred for 95. It was nevertheless a superb innings which gave the dark blues hope, as they ended up on 212, just 13 behind. Oxford felt like they were taking momentum into the third innings, having been so far behind on the evening of day one. However, the Cambridge batsmen showed impressive resolve. The pitch seemed to offer less movement than it had the day before and wickets were harder to come by. Nevertheless, the Oxford bowlers did well to keep the scoreboard under control, with left arm spinner Ben Swanson, in particular, bowling economically. Although Cambridge continued to accumulate steadily, Oxford never felt as though they had lost control of how the game was progressing until Tim Moses came to the crease. He had already scored quick runs in the first two games of the varsity series, and once again started to find the boundary with regularity, setting up a declaration with an exhilarating 80 not out of 65 balls, leaving Oxford a monumental 431 to chase in three and a half sessions. Once again, Oxford were asked to negotiate a tricky mini-session before the close, but this time managed it without loss: Hughes on 28 and Escott on 21 at the end of day three. This gave the dark blues hope that a win or draw was within their reach on day four, but Crichard again had other ideas. He took six wickets, to add to his five in the first innings, which decimated the Oxford top order. While Jamie Gnodde had been at the crease, a positive result for Oxford had still seemed a possibility, but when he was run out for 54 and the in from Rackow was caught at short leg a few overs later, hope seemed all but lost. Despite valiant efforts from Jack Harrison and Toby Pettman, who survived 108 and 51 balls respectively, the game was lost around half an hour into the final session. Fittingly, Crichard took the final wicket. 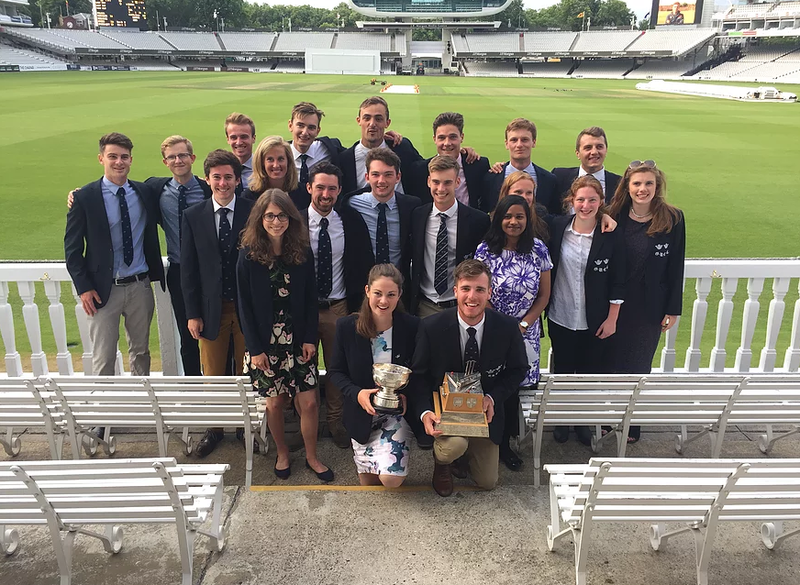 The loss was a sad way to end what had been an excellent season for Oxford, including a varsity win at Lord’s and a second place finish in the BUCS league. It was nevertheless an extremely enjoyable four days, made so by a great group of guys led brilliantly by Matty Hughes, as well as by the committed support of the parents and alumni who attended. To keep up to date with all our latest news, visit our website and follow us on Facebook and Twitter. A new year is upon us and the hockey season begins again. Last season was incredibly successful for the Oxford University Hockey Club (OUHC), and we hope to improve on this in the upcoming year. Highlights included the double varsity win at Southgate and the Men’s Blues promotion in the Saturday League. Alongside the main competitions, OUHC had a splendid season more informally, with a fun Summer League and an exciting boy’s match against alumni. Hockey didn’t cease with the end of the Oxford terms either. Most notably, Shona McNab was selected for the Scotland U21 side and had a fantastic time in the Czech Republic at the Eurohockey Junior Championships. Meanwhile, Ryan Kavanagh’s summer experience was very different. Through the helpful contacts of John Shaw, he was catapulted to stardom as an actor in a Bollywood hockey movie. So, keep an eager eye out and watch this OUHC player hit the big screens sometime soon. For this academic year, the Blues preseason led by Andrew Oxburgh and Megan Hughes got off to a cracking start. Still coached by the stalwart John Shaw, both teams have been very successful in their friendlies and have received a strong intake of promising freshers. Similarly, the Occasionals, coached by Mark Rutherford, have started the season well, as have the Radicals, Mavericks, Infrequents and Sporadics who are being coached by the blues boys. Excitingly, Shona McNab is the first female Blue to be a coach, as she turns her hand to getting the Infrequents into shape. In our intentions to surpass last year’s performance, the club is keen to improve its training through means such as strength and conditioning, and recording matches for review. This, as well as new equipment, will be needed if we really want to maximise the club’s potential. We are all looking forward to and are extremely positive about what the seasons holds for us! Alumni are always welcome at Iffley road but particular dates for the diary are the Alumni dinner in January, the 2s, 3s and 4s Varsity in Oxford on 18 February, and the Blues Varsity at Southgate on 4 March. If you would like to keep up to date with OUHC, please follow us on Twitter, Instagram and our website. 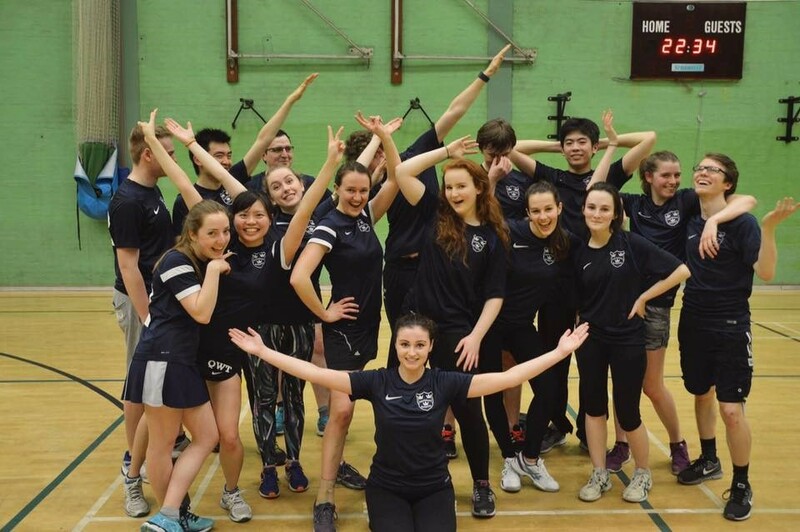 Oxford University Korfball Club (OUKoC) continues to thrive on creating a welcoming and relaxed atmosphere in which new players can join a university-level sport and cultivate a passion, competitiveness and love for Korfball. We welcome both experienced players and complete beginners, and through our social and friendly ethos produce members and alumni with a real love for Korfball. 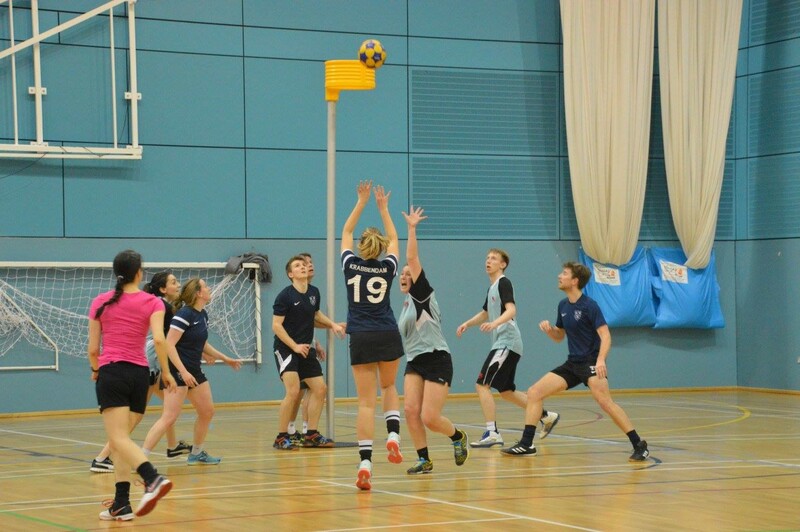 Korfball is rapidly growing in popularity across the UK, especially at universities, where most people first pick up the sport. Over the summer vacation we competed in two tournaments in which incoming and outgoing members had a chance to play together in a completely relaxed and informal setting. Since the start of the academic year, our focus has been on recruitment, and having received almost 300 names at Freshers’ Fair we welcomed a huge variety of people to our two taster sessions, including over 50 complete beginners to the sport. We started off the season with a First Team win against Oxford City 3 and a very close loss for our newbies against Oxford City 4 in two friendly matches. Now the focus shifts to nurturing and encouraging our new players, and improving our overall performance so that we can put out two good results at the first BUCS tournament in late November. By next term, we hope to have two competition-ready teams so that we can advance our BUCS placing, as well as our score tally at the annual Varsity match against Cambridge – including for the alumni team which is an integral part of our club’s community. It would also be great to see more players advance to regional and international levels. However, although a brand new four-court sports hall is due to open at Iffley Road in March 2018, competition for space in the current hall has forced us to forfeit one session a week and to fund our own extra sessions at an external venue, limiting our training time. Any extra funding we are able to secure will help us continue to train at our best. Another focus over the summer has been securing part-time regular coaching. Thanks to the help of local clubs we have achieved this, though timing slot shifts have again meant that not all OUKoC members have felt the full benefit. Nevertheless, despite initial setbacks, the success of our recruitment and first matches has left us excited and driven to take on the new season and to continue to advance this social and competitive sport’s status within the university! If you would like to keep updated on the club’s progress and activities you can follow us on Facebook, Twitter and Instagram. Oxford University Lacrosse Club (OULC) continues to thrive among university sports. This year we have over eighty members, and welcome many beginners to the club. We are also proud to announce our new partnership with online recipe creator, Mob Kitchen, who has funded some new equipment for the season. 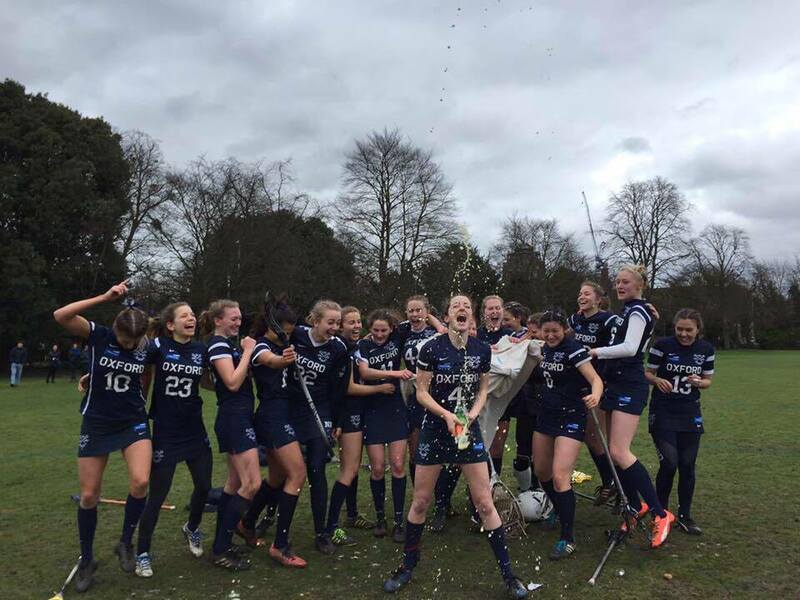 The 2016-17 season was fiercely contended and saw Oxford place third in the BUCS South Premiership division and first in the SEMLA 6s intermediate division. 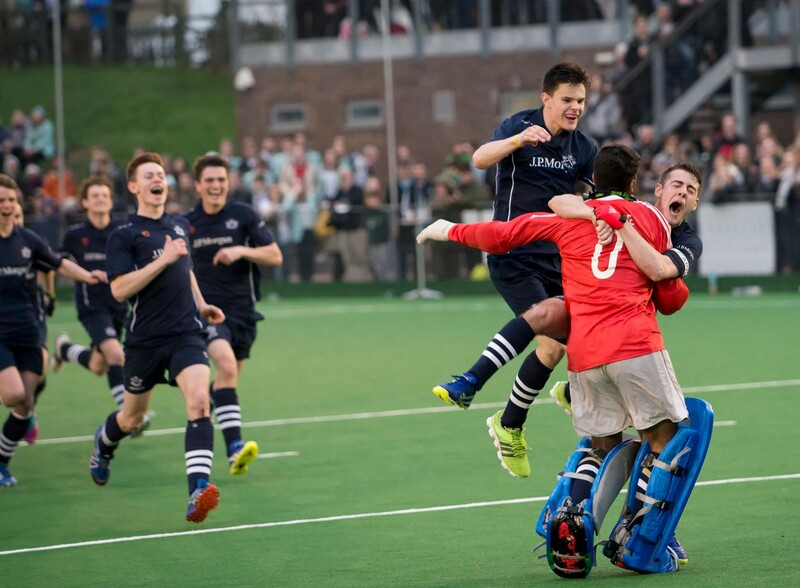 At the 2017 Varsity match, the Blues retained the trophy for the sixth year in a row, after a 6-6 draw away at Cambridge. Last season also saw the men enter the Oxbridge AllStars into an international tournament in Berlin. Last season saw the Blues reach the BUCS semi-final in Edinburgh. This was an outstanding achievement for the team, which, despite a loss, was in high spirits and played exceptionally well. The Swifts also won its Varsity match in an astonishing comeback, finally beating Cambridge by one goal. Despite a loss at Varsity, the mixed team dominated the league in the 2016-17 season, winning all of its games by a large margin. This is particularly impressive given a number of its players were new to the game at the beginning of the season. At the end of the summer vacation, all three sections of the club hosted pre-season training to prepare for some tough matches ahead. Both the men’s and the women’s teams have their sights set on winning the BUCS Premiership division this season, and the mixed team hopes both to keep up its high standard in the league and to secure a Varsity win. Last year, as our results showed, captains did phenomenal work planning practices and giving individual feedback. As the club continues to grow, we hope to be able to afford qualified coaches for all our teams. In several fundraisers over the year we will be looking to raise enough money to cover the cost of this advantage, without increasing subs. We hope that this will give us the edge against Cambridge in the future. This year, the 102nd Varsity Match will take place in University Parks on 24 February 2018, and we would love to have our alumni supporting on the sidelines. The day will include first and second matches for the women’s and men’s teams, a first match for the mixed team, and the infamous alumni match. Food and drink will be available throughout the day. If you are interested in playing (even if you haven’t picked up a stick in years) email lacrosse@sport.ox.ac.uk. Do you remember Laxmas? This year’s alumni secretaries Matthew Jamshed and CJ Lewis are bringing it back in the form of a Christmas meal in London. If you would like to attend, please email lacrosse@sport.ox.ac.uk or send us a message on Facebook. Further details will be released nearer the time. Want to see a match again? All our fixtures can be found on the BUCS website. What have you been doing? Are you still playing for a local club or have you seen some lacrosse recently? We love to hear what our alumni are up to, so do get in contact. Email me, visit our website, or follow us on Facebook or Instagram. Oxford University Lifesaving Club (OULSC) is a small, friendly club, dedicated to learning lifesaving skills for use in, on and around water. Founded in 1995, we train twice a week during term time at the Rosenblatt Pool on Iffley Road. 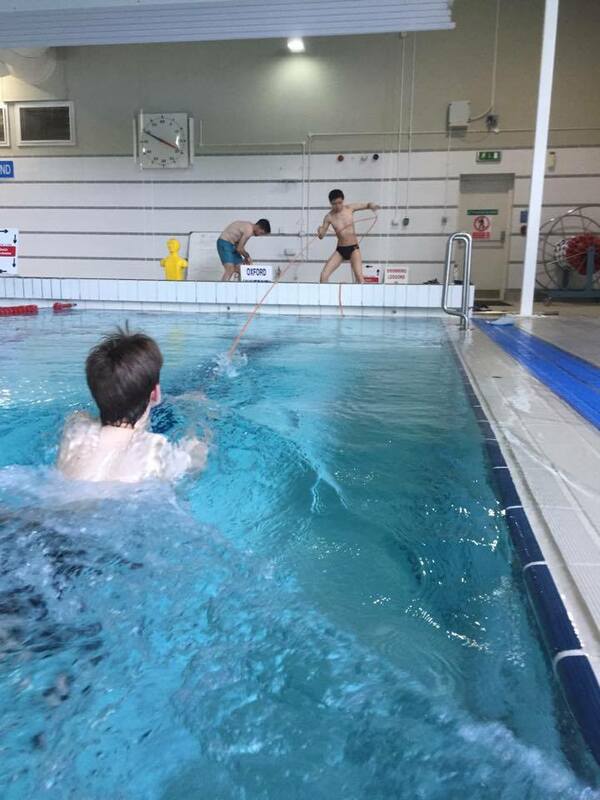 On Tuesday evenings, we spend an hour in the pool focusing on speed lifesaving, improving swimming technique and developing stamina. We also train dry-side for an hour on Saturday afternoons, practicing basic first aid, CPR and lifesaving theory, before spending an hour in the pool honing our aquatic rescue skills. These sessions are great preparation both for competing in lifesaving competitions and for working towards the RLSS Survive and Save awards. The former typically involve working in teams to respond to simulated emergencies, and competing in speed events such as the rope-throw and the swim-and-tow relays. Last year our club gained three new members, attended an inter-university competition in Birmingham and ran the Save an Adult’s Life workshop in Mansfield College. Unfortunately, our annual Varsity match against Cambridge was cancelled as the Cambridge University Lifesaving Club has now been dissolved. In this new academic year, we plan to train for the RLSS awards in order to ensure our members possess lifesaving techniques that are relevant and up to standard. In addition, we aim to get involved in at least two competitions in Michaelmas and Hilary. We were only able to take part in one competition last year due to a shortage of funds, and members had to cover their own transport costs, so this year we hope to be able to financially support our members to encourage more to take part. 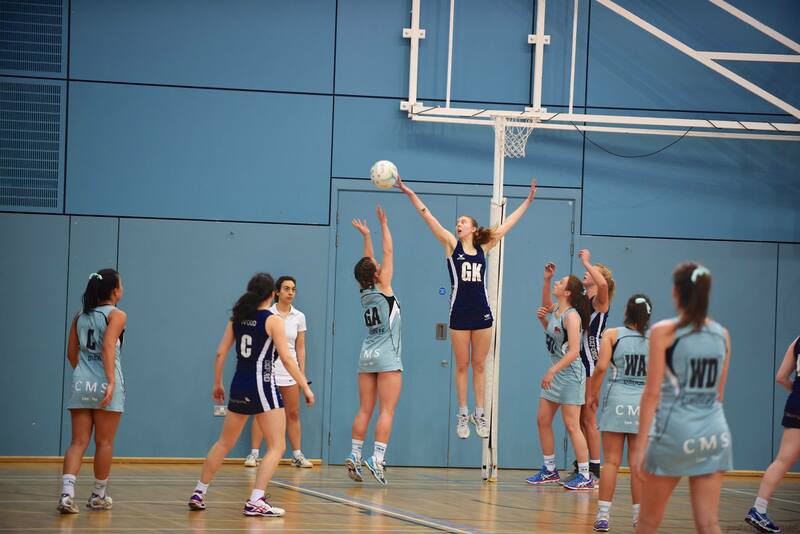 Oxford University Netball Club (OUNC) had a hugely successful 2016-17 season. The Blues were promoted into Midlands 1A and the Roos maintained their position in Midlands 2B. Netball is the fastest growing female team sport in the UK and this is reflected in the depth of talent we have in the club. For the first time this season the club’s third team, the Emus, have entered BUCS. Fresh off a fantastic 58-3 win against Birmingham City 3rds in their first match, this is set to be an exciting season for the Emus in their inaugural BUCS campaign. Over the summer the new committee has been hard at work to build on the previous season. The new club president is Antonia Murray, a third year Geography student at Worchester. Antonia is a much-loved member of OUNC. She has a strong vision for the club and we are very excited to have her as our new president. Elsa Wakeman, a second year Economics and Management student at Brasenose, joins Antonia as club captain for 2017-18. Elsa was a member of the England U17 and U19 teams, and played for Superleague Champions Surrey Storm. She is a talented player and brings a wealth of experience to OUNC. After several fantastic seasons together OUNC is sad to say farewell to Tricia Kilczynski as Head Coach, and we wish her all the best with her netball coaching career. We are currently looking for a new head coach for the upcoming season and are fortunate to have Elsa taking on this role in the interim. Anyone interested in getting involved is strongly encouraged to contact Elsa for more information about the role. We are also thrilled to have Berwin Leighton Paisner on board as the club’s new sponsor for the 2017-18 season. More information about our partnership with Berwin Leighton Paisner can be found on the OUNC website. Finally, the 2018 Varsity match will take place in Oxford on Saturday 24 February. Following a fantastic result of two wins from three teams we are aiming for a clean sweep in 2018. Planning is underway for the club’s third annual pre-varsity training camp. The Blues and Roos teams went to London in January 2017 for 3 days of skills training and matches against local teams. This training camp has proved invaluable in giving us the edge against Cambridge in the lead up to the Varsity Match and we hope to take the Emus team this season if we can arrange additional funding. You can keep updated on our training, match schedule, results, and events by following us @OUnetball on Instagram, Facebook, Twitter, or via our website. 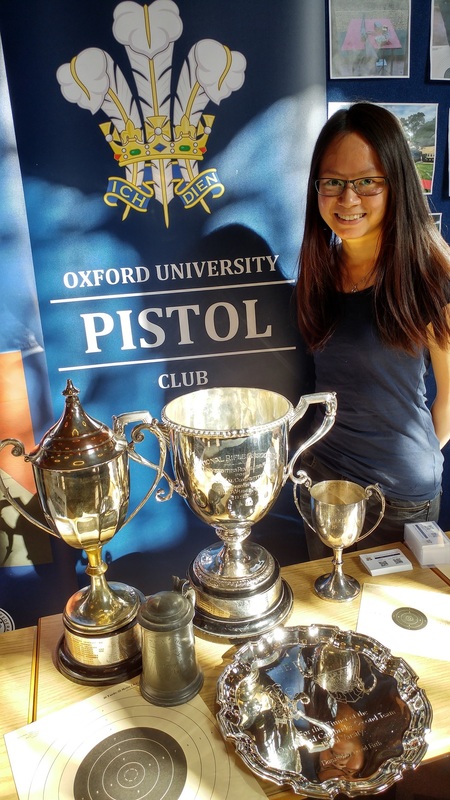 Oxford University Pistol Club (OUPC) had a very eventful summer in 2017. At the annual Imperial Meeting, we defeated Cambridge in the Full Bore Varsity match for the second year running. At the same time, star shooter Wing Nam (Coco) Yiu achieved the club’s very first Discretionary Full Blue (DFB), which followed our receipt of DFB status earlier this year. The DFB criteria are set at an exacting level: the competitor has to shoot in the top team in both the Small Bore (air pistol) and Full Bore (gallery rifle) Varsity matches against Cambridge, and, in at least one match, exceed a fixed score threshold which few shooters in the club’s history have achieved. The Full Bore Varsity took place in July at the Imperial Meeting, one of the biggest shooting events of the UK calendar. 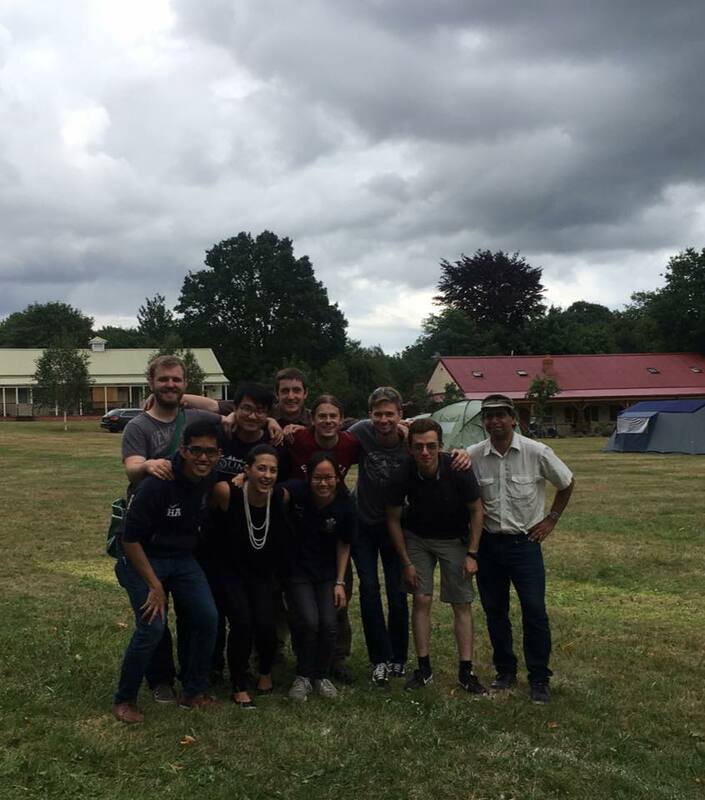 OUPC turned out in force for the five days, pitching tents and setting up barbecues in the campsite at the National Shooting Center. Having already acquitted herself well during the Small Bore Varsity in Hilary term, Coco was a likely candidate for the inaugural Discretionary Full Blue. 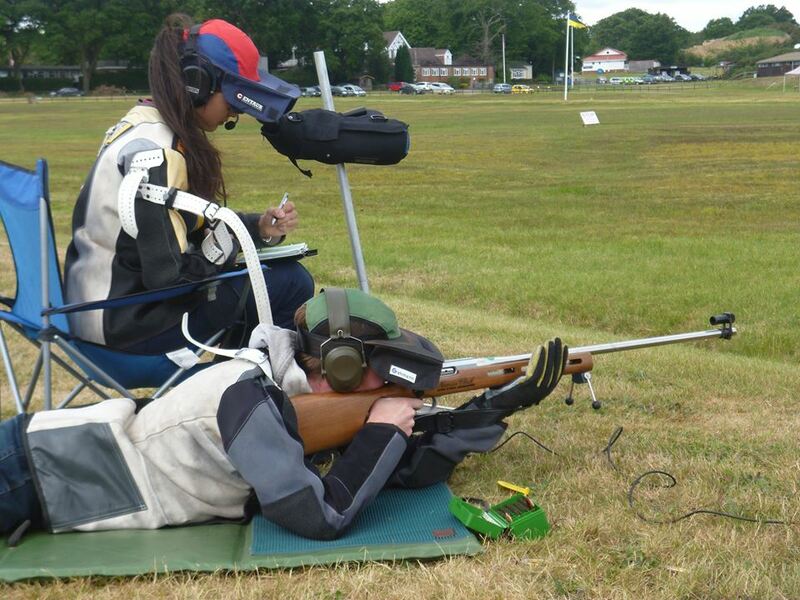 Her performance during the days leading up to the Varsity match easily secured her a spot in the team, and some spectacular shooting on competition day made OUPC history. competition. We created a new OUPC Facebook page, to promote visibility and provide a channel for updates on upcoming events. In addition, the club is expanding its participation in the shooting scene: we have entered teams in the Midlands Postal League for the first time, and are lining up teams for the Universities Postal League and a competition with Imperial College later on in the year. Finally, we are looking into an overhaul of our air pistol equipment over the coming months if funding allows, to improve the consistency and performance of the club guns ahead of the first Varsity match in Hilary term. Training for new members has begun and it’s safe to say there’s a lot of potential to be developed! We are eagerly anticipating the Past vs Present match with our alumni later this year. In addition, planning for the Annual Dinner in Hilary Term has already begun, and invitations will hopefully go out before Christmas. Oxford University Polo Club (OUPC) was founded in 1874, just three years after the introduction of polo to Britain. It continues to be a thriving and successful club, creating history in the polo world to this very day. Despite its prestige, OUPC is a relaxed and sociable club, and we encourage students from all backgrounds to participate in the sport, whether they are complete beginners or seasoned professionals. We hold regular lessons throughout the year with David Ashby and his team at Oxford Polo, which help our members to develop the basic skills necessary for the sport. During the Arena Season (Michaelmas and Hilary) we are based at East End Farm in North Leigh, and during the Summer Season (Trinity) we are based at Kirtlington Park Polo Club. To help put the foundations of the sport into practice, we also organise friendly and competitive matches and tournaments at all levels among OUPC members, with other universities, polo clubs, and professional teams. 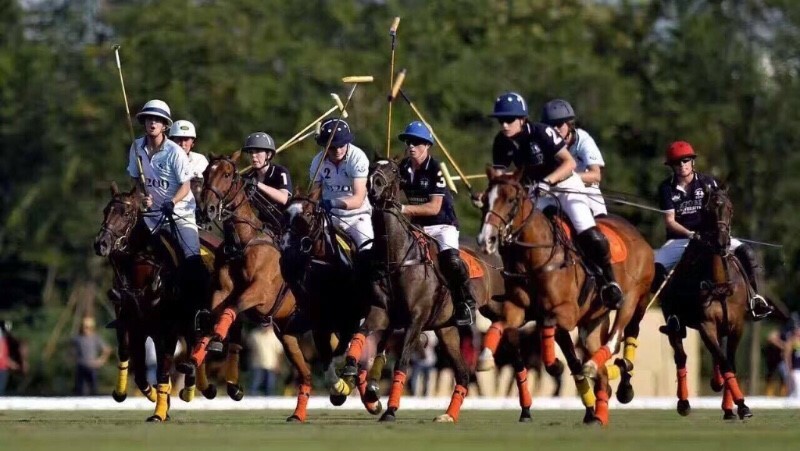 At OUPC, the highlight of the year is the annual Varsity Match against Cambridge, played on the grounds of Guards Polo Club during Trinity term. OUPC is a leading university team with a strong international presence and record. In the past, overseas trips have been held to India, playing against the Indian Cavalry, and to Dubai, with British Polo Day. For several years, OUPC has also been invited to play in Tianjin, China in the Metropolitan Intervarsity Tournament against Cambridge, ULU, and several Ivy League universities. In 2017, Oxford were crowned champions – the cherry atop the most successful season in OUPC history. 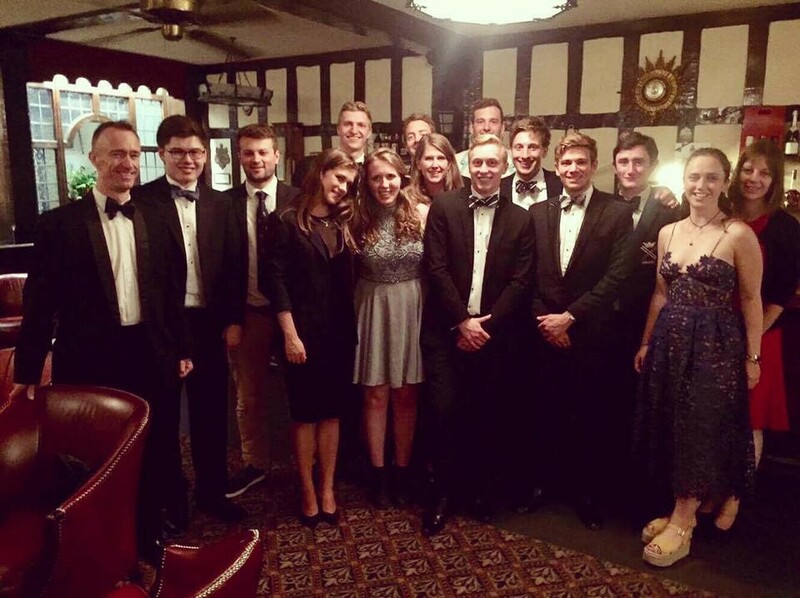 As well as our packed polo schedule, we hold regular and varied socials, gatherings, alumni dinners and events, to which we invite guests with open arms. The highlight of the year is our annual white-tie ball, which will this year be held at the Tower of London. Our ball committee is currently looking for partnerships so please contact natasha.salonen@hmc.ox.ac.uk if you have any ideas of opportunities. 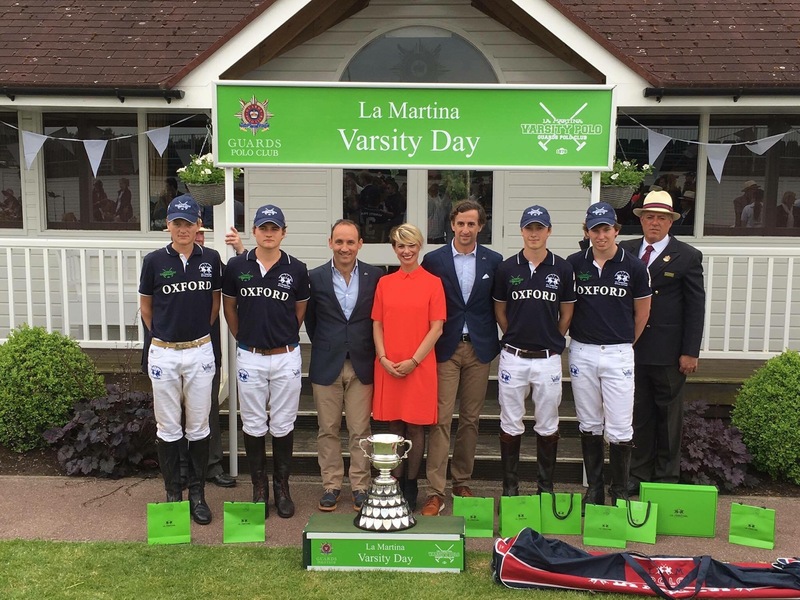 OUPC is delighted to have La Martina as its official kit and equipment supplier for both the Varsity match and the club, as well as British Polo Gin as its official spirits supplier. 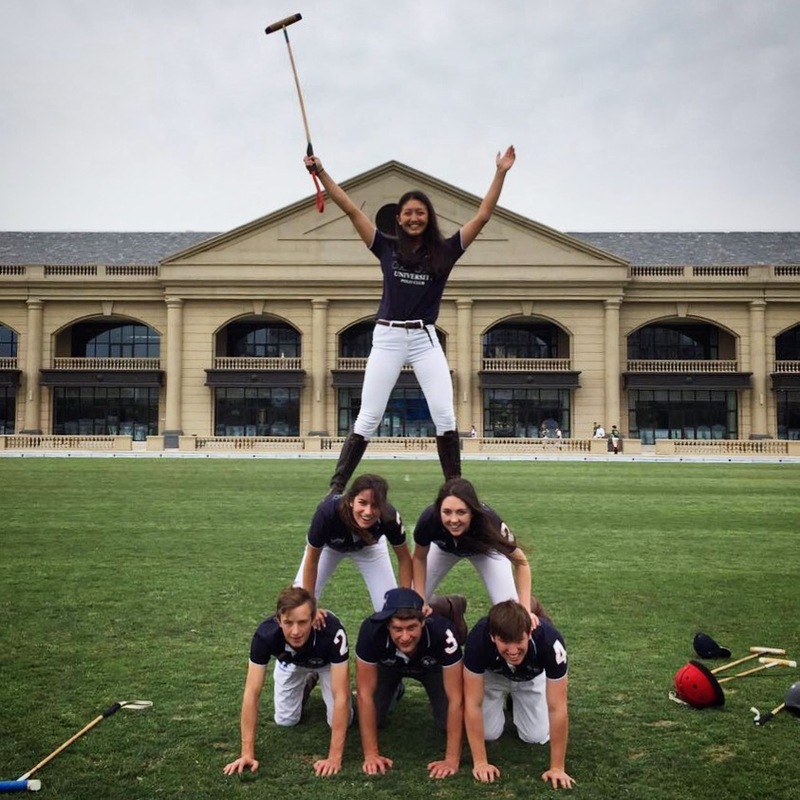 Through these relationships, the club has been able to increase access to the sport of polo to university students. We hope to continue in this direction by securing additional funding this year to make coaching and horse hire even cheaper. Please contact OUPC with any queries or suggestions at polo.club@studentclubs.ox.ac.uk, or the Chairman, Aurelia Vandamme, at chairman@oupoloclub.co.uk. 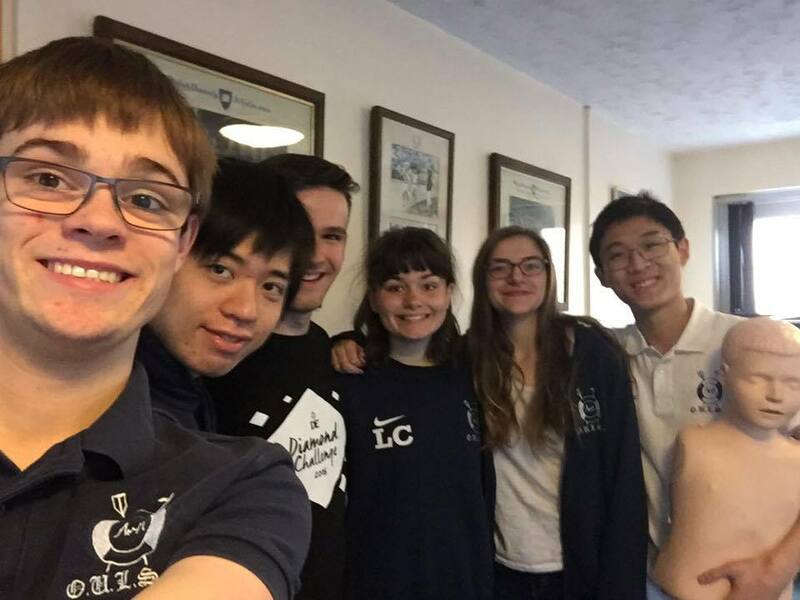 Oxford University Rifle Club (OURC) has had a busy summer as always, filled with many individual and team successes. The highlight was of course the Imperial Meeting, where, among other achievements, Jonny Page achieved a bronze medal in BUCS and the Universities Long Range team came third in their matches. As for the Varsities, OURC fielded a very strong Humphry (match rifle) team, who, despite not being able to best their opponents, held their own and continued the trend of closing the gap between us and the other place. We congratulate Cambridge on their record score and are pleased with the advances we have made this year. Particular congratulations go to one of our newest members, Sam Sutton, who was awarded a half-blue for his performance in the match. 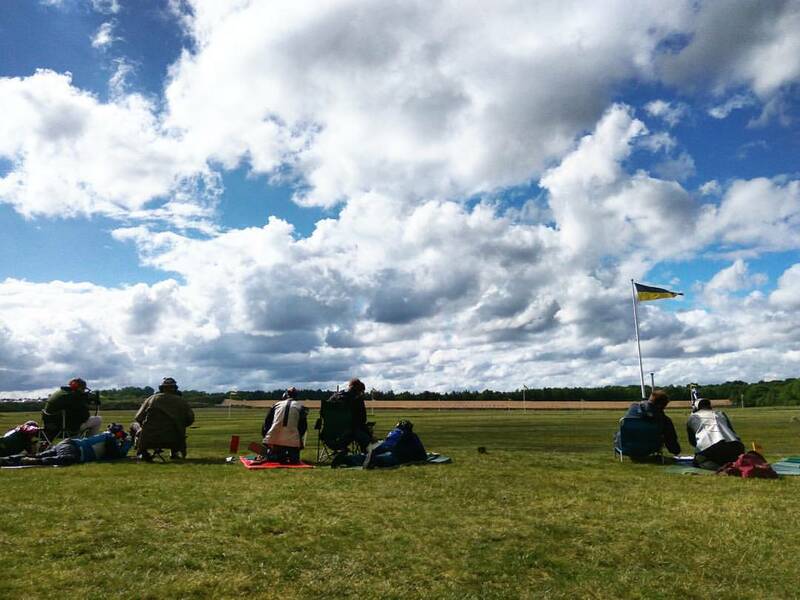 The Humphry has unfortunately often seemed like a one-sided competition in previous years, but thanks to the efforts of our Match Rifle Captain, Katherine Lightbown, and the hard work of our match rifle shooters, the competition is now a much fairer fight. We look forward to giving Cambridge a run for their money this coming year by continuing our training, obtaining new stands, and acquiring a left-handed match rifle. Similarly, we continue to close the gap in the Chancellors’ (target rifle) and are targeting our team match skills. OURC’s team was composed of both experienced shots as well as new members to the club, all of whom performed exceptionally well in what was for many their first fullbore varsity after having taken up the sport only a few months earlier. A special mention should go to Tom Frame, who despite not being able to shoot the Imperial this year, was able to make it over to Bisley for the Chancellors’ match before jetting off to Portugal for a year abroad. Tom put down a remarkably impressive score, especially considering he only had five shots in the zeroing range to warm up after a few months of absence from fullbore! The Rhodes Cup, once again battled out with black-powder pistols, was, on the other hand, won by Oxford; a prestigious title we will endeavour to retain. Bring on next year! The OURC Jersey Tour 2017 came next, in which four intrepid explorers from OURC ventured to the distant land overseas. Conditions were calm and afforded the chance to experiment and consolidate any new techniques developed over the summer – Michael Horrell, for example, achieved a perfect score along the way. OURC accomplished an impressive third place in the teams’ match, while Senior Advisor-elect Sam Jauncey earnt the top under-25 trophy. Sam also endangered the entire OURC contingent by taking them swimming in very rough sea waves, but given his success he is forgiven. Thank you to JRA and Sam for their hospitality and showing us around the Island, we all had a wonderful time. OURC has also made the most of the pre-Michaelmas match rifle season: Hattie Mansell achieved third under-25 during the Autumn Meeting, while Katherine Lightbown was awarded the under-25 trophy for her performance in the Cambridge Cup. It’s pleasing to see that the club is making strides in this discipline, and this sets us in excellent stead for the coming year. Finally, congratulations to OURC’s Jonny Page, who, following a difficult selection process, has been chosen for the English Twenty Development Squad! Instating a new smallbore session for a development squad, which will exist along with the general and Blues sessions. Securing external coaching – and we hope to have a regular coach starting this term. The fresher sign up is looking stronger than ever and we will work hard to capitalise upon the work of the previous committee. As a final point to note: the OURC Annual Dinner 2017 will be held on Saturday 25 November at Somerville College. We hope to see you there! Otherwise, if you’d like to keep up to date with the trials and tribulations of OURC, you can follow us on Facebook, Instagram and on the OURC website. We are delighted to report that the Topolski Fund – a major new rowing endowment which provides equal support for both men and women rowing for the University – has now been formally established. Named after legendary Oxford coach, Daniel Topolski, the Fund is the result of a great deal of hard work by the Oxford clubs and a very generous £12m pledge from an anonymous donor. It comes at a time when the need and urgency for support has never been greater. The sense of permanence created by the long history of the Boat Race and its prominence in the BBC’s sporting calendar leads most to conclude that all is well with the event. 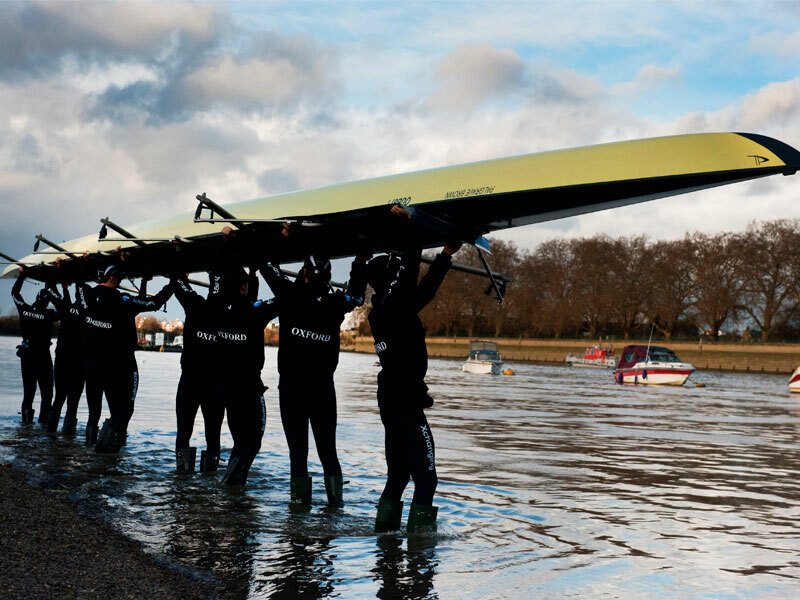 However, both the Boat Race and Henley Boat Races have struggled with sharply falling commercial revenues due to the uncertainty in sponsorship and TV rights markets. As a result, every aspect of the club programmes has seen substantive budget cuts for the last eight years, to the detriment of the student rowers. For the clubs, the Topolski Fund is the best and only way to fund their activities in a sustainable manner. It will allow the clubs, like any other department in the University, to retain their excellent staff, continue to use the best equipment, and will allow students to participate without a significant additional cost to themselves. This will not only provide a competitive, high performance sporting environment, but an educational experience befitting Oxford University. The generous £12m pledge included a £10m gift to be paid over three years and a novel £2m matching component available until January 2019. We are so pleased and grateful to have already received a number of matched donations to help us toward that initial £2m target, although we have some way to go and we will be hosting a number of fundraising events in the coming year to help us secure further donations from our alumni and supporters. We are also pleased to report that the impact of the Topolski Fund has already gone far beyond just financing. Having existed as independent clubs until earlier this year, the four Oxford rowing clubs (OUBC, OUWBC, OULRC and OUWLRC) formed a new Oxford University Rowing Association (OURA) to help ensure the clubs operate as efficiently and cooperatively as possible. Thanks to the establishment of both the Topolski Fund and the OURA, the clubs have already been able to find a number of cost savings. The squads are also far more integrated, and the coaches are even sharing training and physiological programmes. The future of Rugby Fives at Oxford looks bright. As work moves forward at Iffley Road, we continue to look into options for a new Rugby and Eton Fives centre. We hope that this new home, when built, will serve our team better than the last. In the meantime, we have worked hard over the summer to improve our current set up. The courts are being thoroughly refurbished such that navigating the slippery floors which so many of us have had to experience should soon be a thing of the past. In the area surrounding the courts, we have also reached an agreement with staff to remove most of the equipment kept there as storage. The club’s crest is being painted on the wall behind the seating area, and we are hoping to have an honours board for our past captains put up in the near future. Alongside other upgrades, we believe that these modifications will provide a more suitable training environment for the squad; they are small changes, but hopefully with the support of sponsors and donors they will come together to be much more. Possibly the most exciting news is the large number of incoming freshers – and we are also waiting on the return of two ladies after their year out. Added to the fact that we only lost two of our Varsity top-eight matches last year, this means the depth in the squad this year should be tremendous! This makes it especially satisfying that we have finally managed, after many years of discussion, to extend singles to the entire top eight rather than just the top four in the Varsity match. We see ourselves having a serious chance of upsetting the Light Blues this year and so have stepped up our training. Bertie Mills has taken on the role of head of fitness and will be organising weekly early morning sessions as we look to improve in all ways possible. We are not just looking to turn things around in the men’s matches though. For the first time, we have scheduled a ladies’ fixture list complete with tournaments and matches akin to that of the men’s squad. As one of our main aims this year is for a serious push in the ladies’ section, we hope by the end of the year to have come up with a plan to expand the ladies’ team and see it become a Half-Blue sport too. So, from material changes to the courts, to a big injection of fresh blood, these are very promising times for Oxford Rugby Fives. All aspects of the club are improving and we hope that this will be rewarded by an end to the Cambridge dominance of recent years. The enthusiasm which is drilled into us, however, must be credited to the alumni. Your constant support and advice has been invaluable in driving the club forward. The entire squad looks forward to telling you more and thanking you at the Past vs. Present dinner in February. Please email thomas.owen@st-hughs.ox.ac.uk for more details about either event, and to find out how you can get involved. Fives is not only developing on the court, but also off it. Accordingly, we have revamped our website with some useful and interesting information about the club’s history, its current state and how it can grow in the future. It even includes a list of every Varsity team and result since 1925, as well as some team pictures. It’s been a busy summer for Oxford University Rugby League FC (OURLFC) as we build towards the start of the BUCS season. The highlight was undoubtedly the inaugural tour to Budapest where we took on Hungary RL. The tour was a great success and the combination of our on-and-off field prowess saw us beating the team 54-8 before enjoying what Budapest had to offer. Many thanks must go to Hungary RL for hosting us. A couple of weeks after our return to the UK, we headed to Cheltenham for our annual pre-season training camp. This was another great success with numbers further increased from previous years. As well as a good number of returning players, ten new faces were put through their paces for the first time, including a Matt Queralt special at Cheltenham Crossfit Club and an education in shape from Head Coach Tom James. Again, thanks must go to Cheltenham Tigers for putting up with us. This term started with the annual inter-collegiate Cuppers tournament, which took place on the Saturday of Freshers’ week, with a good 9s tournament at Oxford RFC. On Wednesday 11 October, the season began properly with the Blues taking on the newly promoted Birmingham to kick-off BUCS Midlands 1a division, as we began our attempt to reach the Southern Premiership again. The Maroons, meanwhile, will be competing in Midlands 2b, attempting to be promoted straight back to 1a. Their campaign started on the same day against Nottingham 2s. Looking forward to next term, the two big dates for the diary are the 16 February Derby Day at Iffley Road against Oxford Brookes and of course the 2 March Varsity Match at the HAC. I hope you can join us for either of these! Oxford University Rugby Football Club (OURFC) enters its 148th season at a critical juncture. 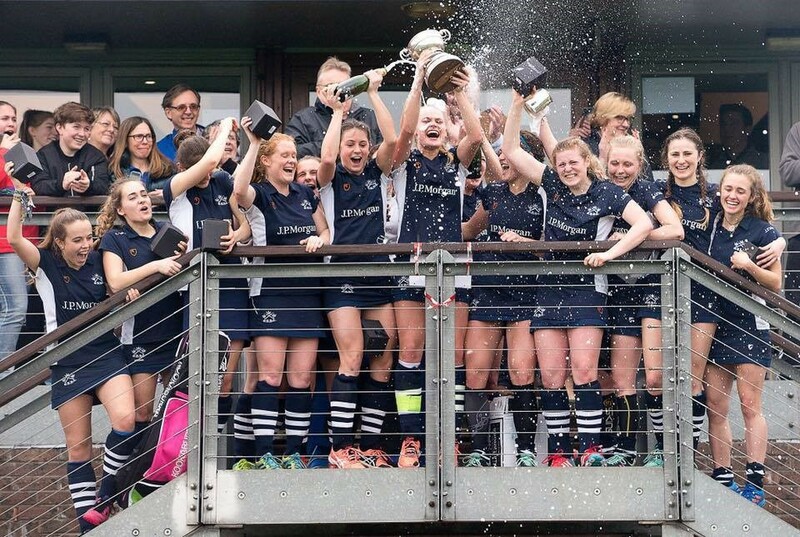 With over 1,000 members across the collegiate University, and a significant increase in the number of women now playing the sport, OURFC has never been more popular or relevant at Oxford. To ensure this growth can be supported and sustained, and to guard against the decline in sponsorship of the Varsity Match, OURFC has launched a permanent endowment fund. Our target is to build the endowment to £5million by 2019 and, thanks to the generosity of OURFC alumni, we have now raised £2.6million and passed the halfway line. In January 2017, we also announced the creation of our new supporters club, The 1869 Society. Anyone can become a member and information about how to apply can be found here. 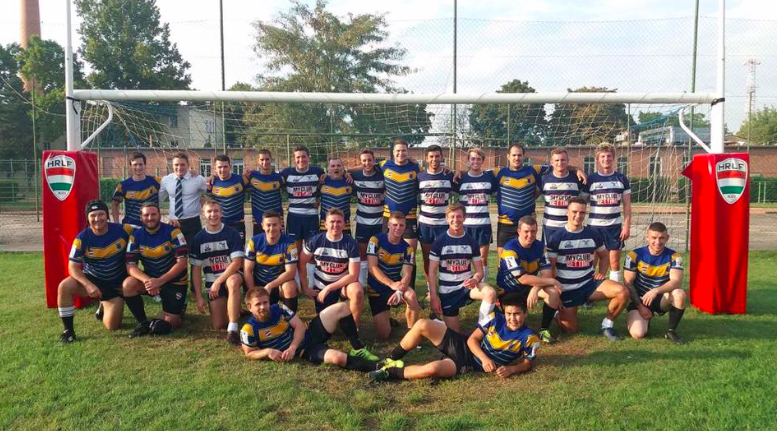 In the second-XV matches, the men’s Greyhound team celebrated a second victory, winning 49–8, while the women (Panthers) suffered a 30–0 loss. The men’s Under 20s beat Cambridge 22–19. If you would like information on tickets or hospitality packages, please email tim.stevens@sport.ox.ac.uk. To keep up to date with all our news, fixtures and results why not take a look at our website. 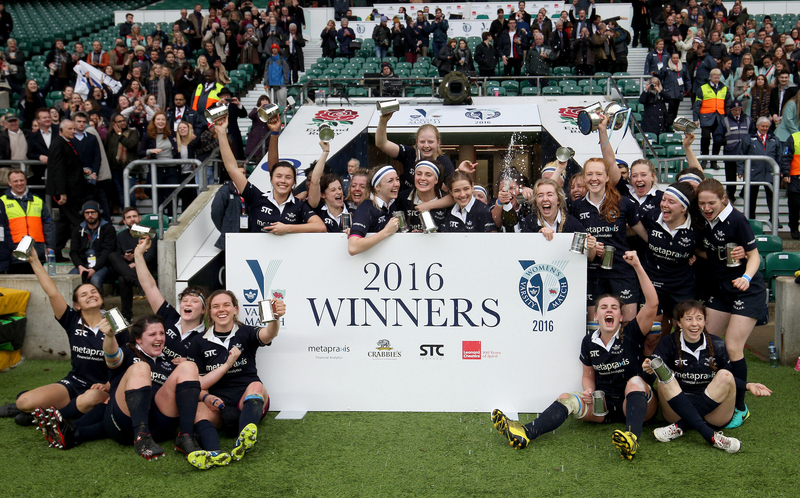 The men can also be followed @OURFCblues on Facebook and Twitter, and the women @OURFCWomen. 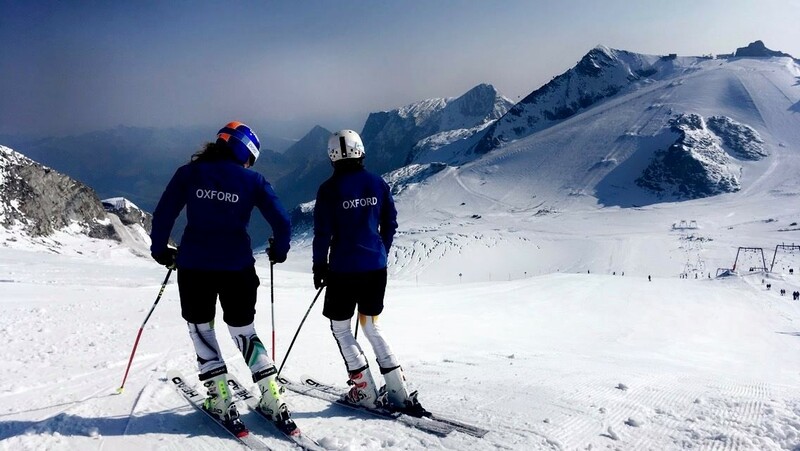 Oxford University Ski and Snowboard Club (OUSSC) has been hard at work over the summer, getting into shape for the Varsity races which this year will be held in Tignes from 30 September – 9 December. The pressure is on to retain the men’s and women’s team trophies, but all the teams are looking strong! I am pleased to update you on the club’s dedicated preseason preparations and our exciting line up for the winter season. OUSSC Glacier race-training took place at Hintertux in early September where the team was put through their paces by Phil Brown of Impulse Racing. The club also ran a second training weekend to “the world’s largest indoor ski resort” at Landgraaf in the Netherlands. Coached by Chris Pickford of Snow Therapy, the team skied non-stop, making the most of the unlimited snow time, perfect conditions and full FIS length slope. Having found our snow legs over summer, term-time race training at Hemel Hempstead and our revamped fitness schedule will give us a solid basis to take on Cambridge in Tignes. Freestyle is also taking off with OUSSC this year, we have plenty of new faces and are planning to run joint park nights with Cambridge, in preparation for the Varsity slopestyle competition. Having scouted out the impressive park at Landgraaf, we are looking to run a combined freestyle and race preseason trip next year. We are looking to arrange funding for coaching, fitness sessions and kit in preparation for the upcoming season, and any contacts would be appreciated. Varsity is fast approaching and preparations are well underway. We will also be heading back out to the Alps for the British University Alpine Championships over Easter, entering teams in the alpine and freestyle events to finish the season on a high. We are excited to announce that, after sweeping the board in the ladies’ races at Varsity and placing first overall in the GS and 2nd overall in the slalom, Nat Knowles has been selected to take part in the Anglo-Swiss ski races this winter. The annual race, which takes place in St Moritz, sees a team of racers from UK universities take on their counterparts from Swiss Universities. Having recently celebrated its 90th anniversary, it is almost as old as the Varsity races. Well done, Nat! Keep your eyes peeled for our mid and end of season newsletters for results. An excellent alumni dinner took place at the East India Club in London this July, kindly organised by member Milo Smith. It was a lovely evening, providing the opportunity for alumni and current members to catch up and enjoy the East India Club’s fantastic hospitality. Alumni are always welcome on our trips and gatherings – we would love to have you! If you’re in the Tignes area and wish to come along and support at the Varsity races, or would like to be kept up to date get in touch with Katie (katie.campbell@bnc.ox.ac.uk). Several alumni have also expressed interest in an alumni winter ski trip; if you would be interested then let us know. 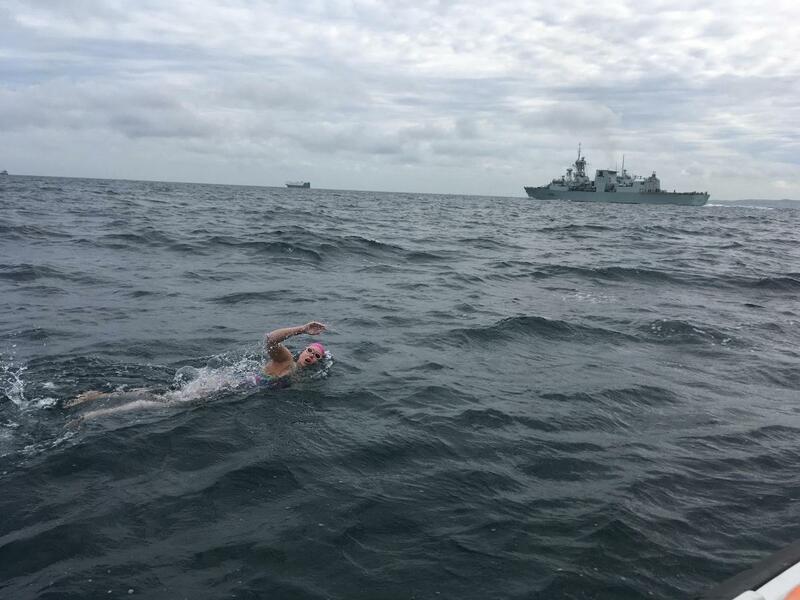 Over the summer, 27 year-old graduate student Dr Victoria Cox successfully completed three of the largest open water swims in the world. Collectively known as the Triple Crown of Open Water Swimming, they consist of the 33km Catalina Channel from Santa Catalina Island to mainland USA, the 34km English Channel from England to France, and a 46km circumnavigation of Manhattan Island. Not only is Victoria the first Australian and only the 164th person to have achieved the Triple Crown, she is one of only 7 to have done so in a single season. 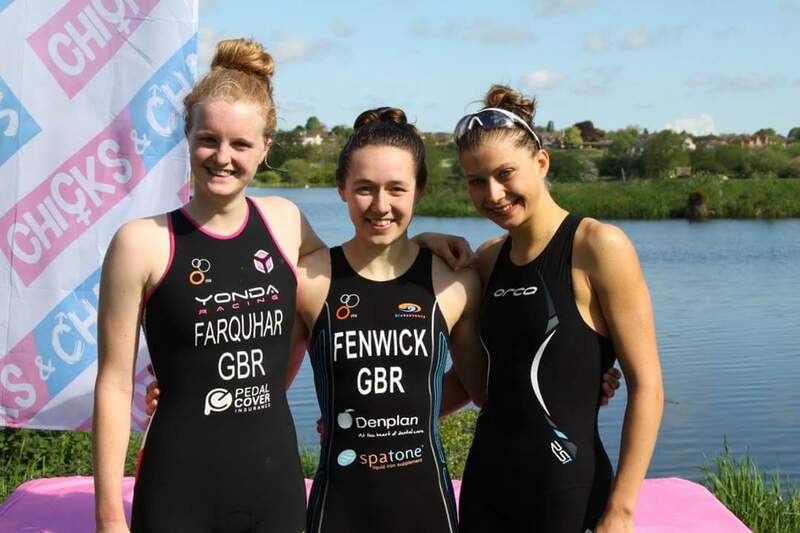 After starting the year focused on pool swimming and competing at the annual Varsity competition in February, Victoria won the 100m Breaststroke and achieved a Full Blue, as well as breaking Oxford University records in the 50m Breaststroke at BUCS, and swimming in the 4 x 50m Medley Relay team. After completion of the pool season, Victoria turned her training focus to open water swimming. Looking ahead, Victoria is the 2017-18 Open Water Captain for the Oxford-Cambridge Varsity Channel Relay, and will guide a team of 6 swimmers from Oxford to swim across the English Channel against Cambridge in June 2018. A very Blue and bittersweet two weekends saw the women winning all of their Varsity matches and the men losing all of theirs. What this was down to, we will never know for certain, although each side was quick to put forward their take on events. The women pointed towards their greater input on the OULTC Instagram (“oultc1880”, worth a follow), while the men blamed an outbreak of injury and illness resulting in numerous absentees. 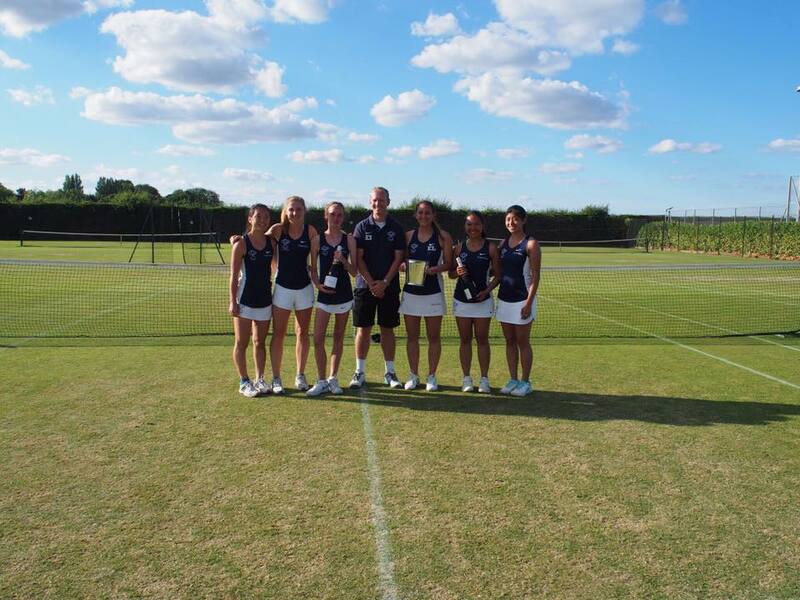 A sunny July weekend at the North Oxford Lawn Tennis Club provided a beautiful backdrop to the tennis that was played by both shades of blue in a tale of two teams. By following coach Ed’s 68x repeated “control the controllables”, the women of Oxford were 9-3 up by the end of day one. Captain Emily, aiming to make sure of victory, delivered a rousing “I have ibuprofen” team talk the following morning that looked to have provided the impetus that was needed. With the perfect blend of experience provided by No. 1 Amy (who barely dropped a game) and incoming skipper Fran, and the fresh energy of Nanami, Sarah, and Inda, the Oxford women ended up resounding winners, 16-5. Sadly, the men were not able to replicate the women’s success this year – not that that prevented some fine and spirited performances. Many a match went to a decisive third set, and last year’s captain Morrow looked to be pulling off one of the great comebacks, having saved nine match points, before the pressure eventually told. The final score was 15-6 to the tabs, although when asked for comment, various sources have claimed this was not a true representation of the fight put up by the men in navy. Until 2018. The girls were simply fabulous; “I impartially love them” exclaimed an ecstatic captain Becca Vaughan. An emphatic victory of 14-7 was achieved and Kiguchi Yumi won 5/5 matches, as cool as the frozen lucozades and water bottles she kindly bought the team. The matches were close but the Rockin’ Robins won every three setter, probably due to the strong team spirit forged over a year sticking together on the sticky Park End cheese floor. The boys lost 18-3, but the score would have been much, much worse if it had not been for the “tactical masterclass from captain Alex Althuis”, claimed incoming skipper Casper. The stacking (rearranging a team’s order to gain an advantage) on display was second to none. Praise must also go to those who stepped up to the plate from M3 to fill the void left by injury and illness. Again, the girls absolutely smashed it, winning 12-9. Captain Claire won 100% of her matches, and commented that Becca in particular, “went out with a bang”, on her last day in Britain before returning to the less grassy courts of the US. M3 showed real promise and looked like going the distance following the singles, trailing just 8-6. However, after the doubles, the final result was a 15-6 loss, with the chaps quick to say they shall right these wrongs in time for next year. Incoming captain Andrew showed real leadership potential by sticking in a three setter after just three hours sleep. “With the help of a lot of deep heat on Sunday morning,” reminisces captain Poppy, W4 won 13-8 overall on its inaugural Varsity. A sizzling highlight was Lottie and Fran winning a hotly contested three setter. The men lost but did not lose their steely determination: Farooq managed to play both singles in a day whilst fasting and, with no water either, beat the Tabs’ 1st seed 6,2 6,2. Straight from the captain Ed’s mouth: “The valiant men of M5 went down fighting against their Cambridge opposition. All sets seemed to yo-yo between tiebreaks and whitewashes. Cambridge capitalised on the former while Oxford too often failed to convert the latter. In the end, M5 lost heroically but convincingly, 5-16. Special mentions must go to David, who poached a set from a former M3 player, and Callum Duff, whose sunburnt legs were later mistaken for hot dogs”. Also, make sure to follow the official Oxford University Lawn Tennis Club page on Facebook for weekly updates on matches and upcoming events! 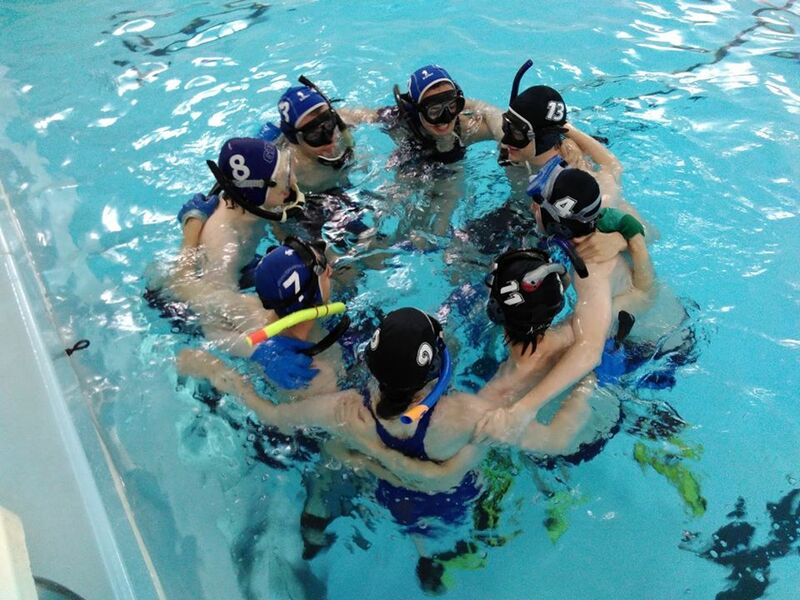 Underwater Hockey is a fast paced, three-dimensional sport played on the bottom of the pool. It is a team game with a twist – you can’t communicate and the person you need to pass to could be 2m above you. It requires a deep understanding between teammates so that they know where each other will be and are able to trust each other to be down when needed. Most people come to university having never played before but with a bit of perseverance are able to pick it up fairly quickly and soon become competitive players. Underwater hockey is easy to learn but incredibly difficult to master making it very engaging and producing highly passionate players always looking to improve. 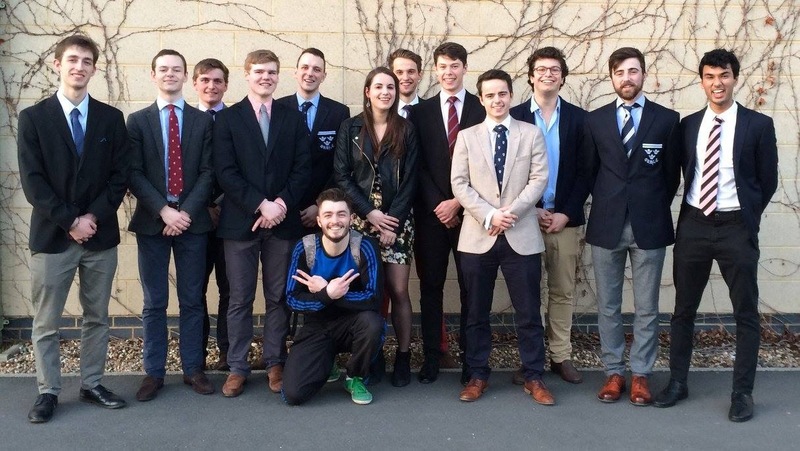 It has been a very successful year for Oxford University Octopush Club, with a fourth place finish at student nationals for the A team (joint best result) and a win in the inaugural Varsity match away, at the very end of Trinity term. The team stormed to victory against Cambridge 5 – 0, with the result never seeming in doubt. These impressive results have been a direct result of the club securing weekly training matches against a local club, and it is vital for our performance that we continue to find funding for this. The club also hosted its 3rd Cuppers competition in Trinity term, in which players from six different colleges were put into five different teams. Many of the players had never played before but after a quick introduction and basic skill session they were all raring to go. Two time (and only) champions Lincoln were not present so the title was up for grabs by a new college. It was St Hilda’s who took advantage of the situation and managed to seal their victory in the final game and finish the day unbeaten. The club has had a very busy start to Michaelmas with an all-time high sign up at Freshers’ Fair resulting in very high attendances at all of our taster sessions. Hopefully, this should result in many new players, an increased squad depth and improved results. The only problem was that we very nearly ran out of kit! With the final taster session over, the attention now shifts to the Oxford Winter Tournament which we will be hosting on 2 December. It is a split tournament with an experienced and novice category played against other university teams, and it will be a lot of our new players’ first taste of competitive hockey and a chance for them to see how far they’ve come since the start of term. It will also be the first time this year that we get to go up against our rivals and see what’s changed from last year. We hope to lay a marker and give out a warning to the other teams to watch out for us at student nationals later in the year. If you would like to keep up to date, we post regular updates on our website. You can also follow us on Facebook and Twitter. 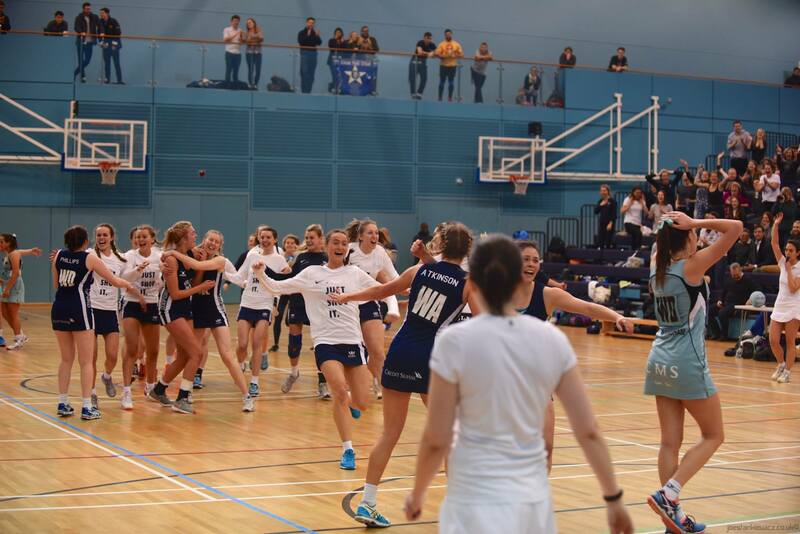 First established in the spring of 1971 to play Varsity against the University of Cambridge, Oxford University Volleyball Club (OUVC) has since become one of Oxford University’s most successful sports clubs. Currently comprised of six teams and over 60 players, the club’s tendency to attract a wide range of international people makes for an unusually multi-cultural and diverse community, offering members a unique opportunity to meet students and professionals from other departments, colleges and walks of life. OUVC has over 300 alumni spread across 30 countries. They represent an integral part of OUVC and the club is extremely grateful for their past and present contribution towards our history, development and achievements. With the club’s 50th anniversary approaching and the launch of its 2021 Campaign to secure volleyball at Oxford in perpetuity, their support remains vital. Every year, the club organises an Alumni Weekend, where previous players and families are invited to come back to Oxford and play indoor and outdoor volleyball against current OUVC members. To receive your invite, please complete our online form on the website. Oxford University Windsurf Club (OUWC) continues to be a friendly, fun club with a mix of members from undergraduates through to academic staff. 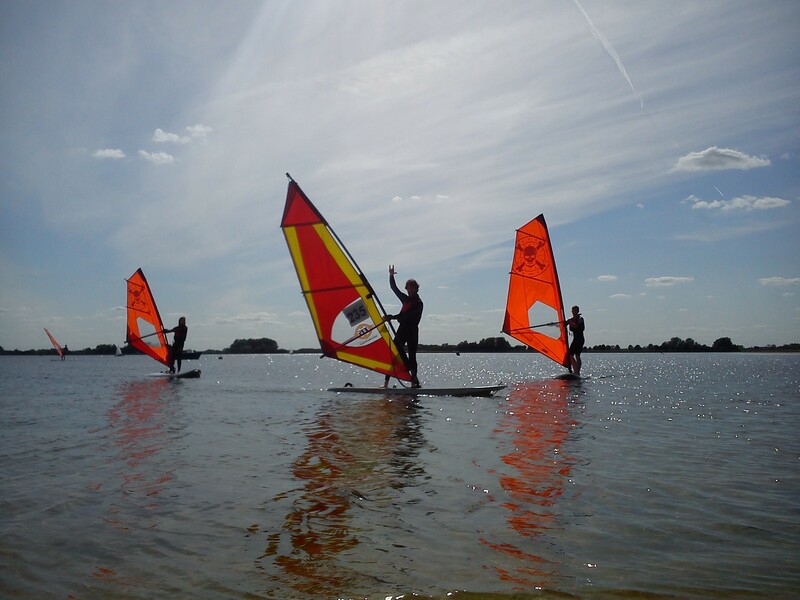 As a club, we focus on providing training for all levels and exploring the windsurf world beyond Oxford – both of which make being a member of our club a genuinely enjoyable experience. One of our main focuses is inclusion. We run beginners’ days each term to introduce people to the sport that we love. These have been very successful in improving standards, both for newcomers learning the basics, and for experienced members, who improve their skills by teaching and communicating them to beginners. Once members are good enough, we supply kit to allow them to get out and practice. 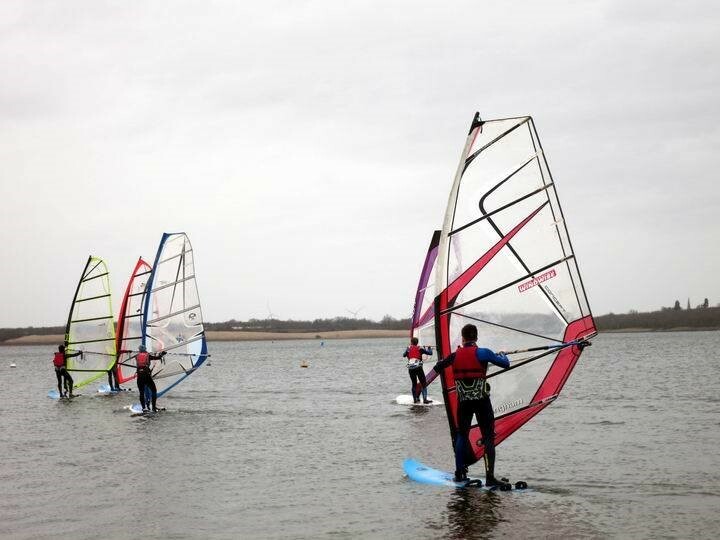 Farmoor is a great place to windsurf and we try to make the most of it. The improvement in standards is reflected in our Varsity results. In 2017, we won the Second Team Trophy for the first time since it was introduced! Though our First Team narrowly lost, we hope to also bring that trophy back this year when, excitingly, we will be hosting the Varsity Match in Oxford. The format of Varsity makes for am extremely competitive match with each team racing three times and the trophy often being contested up until till the last race. Hopefully we will be able to modernise our race kit and use our home advantage to improve on last year’s results and win both trophies this year! We don’t limit ourselves to Varsity, however, and we are keen to enjoy our sport in the most sociable ways possible. We also attend Student Windsurf Association (SWA) events such as Aussie Kiss and Nationals, which provide opportunities to meet fellow windsurfers and compete with some of the best student athletes in the country. 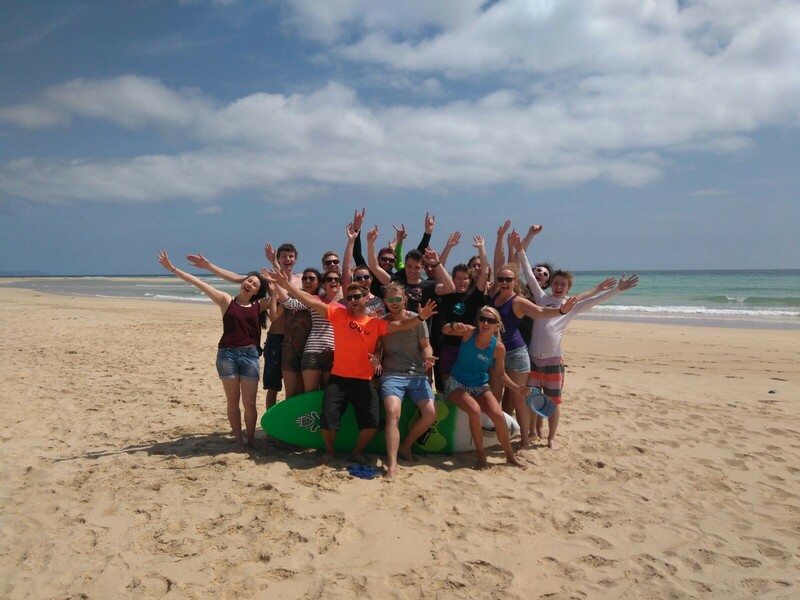 In the spirit of testing new waters, a highlight of the OUWC year is our joint trip to Fuerteventura with Cambridge. This is a great opportunity to improve the standard of our club, both through the quality of training on offer and because we get to practice our wave sailing and freestyle skills in water that is a little more welcoming than Farmoor Reservoir. In 2018, we are celebrating our tenth anniversary trip by opening it up to alumni. If you are interested in a fun week of windsurfing in the sunshine, with amazing tuition and great company, please email windsurfcommittee@maillist.ox.ac.uk for more information. The dates are 17 – 24 March 2018. Interested in what you have been reading? Keep in touch with OUWC by following us on Twitter or Facebook. Please get in touch with Jamie Dumas (james.dumas@devoff.ox.ac.uk) in the Development Office if you have any questions or queries, or would like to be added to the mailing list to receive future newsletters. Mailing preferences can also be updated via our alumni portal (https://www.alumni.ox.ac.uk/).